Hematopoietic stem cells (HSCs) are maintained by a perivascular niche in bone marrow but it is unclear whether the niche is reciprocally regulated by HSCs. Here, we systematically assessed the expression and function of Angiopoietin-1 (Angpt1) in bone marrow. Angpt1 was not expressed by osteoblasts. 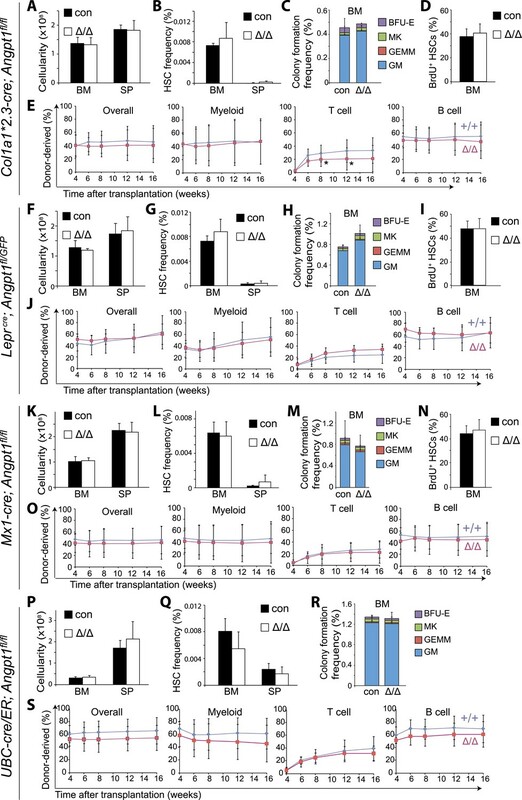 Angpt1 was most highly expressed by HSCs, and at lower levels by c-kit+ hematopoietic progenitors, megakaryocytes, and Leptin Receptor+ (LepR+) stromal cells. Global conditional deletion of Angpt1, or deletion from osteoblasts, LepR+ cells, Nes-cre-expressing cells, megakaryocytes, endothelial cells or hematopoietic cells in normal mice did not affect hematopoiesis, HSC maintenance, or HSC quiescence. Deletion of Angpt1 from hematopoietic cells and LepR+ cells had little effect on vasculature or HSC frequency under steady-state conditions but accelerated vascular and hematopoietic recovery after irradiation while increasing vascular leakiness. 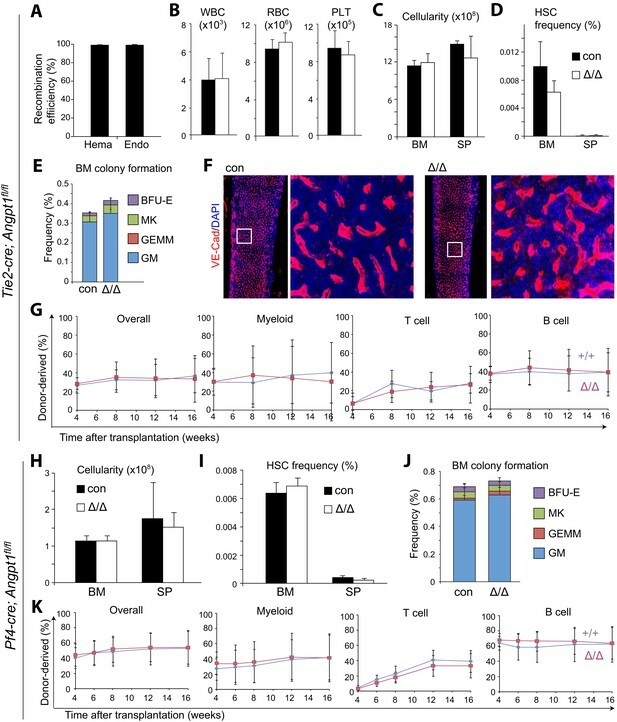 Hematopoietic stem/progenitor cells and LepR+ stromal cells regulate niche regeneration by secreting Angpt1, reducing vascular leakiness but slowing niche recovery. In adults, blood cells develop from a set of stem cells that are found in bone marrow. There are also specialized blood vessels and cells called ‘stromal cells’ within the bone marrow that provide these stem cells with oxygen, nutrients, and other molecules. This local environment, or ‘niche’, plays an important role in regulating the maintenance of these stem cells. But it has not been known whether stem cells can reciprocally regulate their niches. Unfortunately, radiation used to treat cancer obliterates the stem cells and their niche; both must recover after such a treatment before the patient can produce blood cells normally again. A protein called Angpt1 is thought to play a role in this post-treatment recovery. Angpt1 is known to regulate blood vessels in the bone marrow, and one influential study had previously suggested that bone cells produce Angpt1, which promotes and regulates the maintenance of the stem cells within the niche. However, this previous study did not directly test this. Thus, it was not clear whether Angpt1 promotes the regeneration of the stem cells themselves or if it regulates the rebuilding of the niche. Now, Zhou, Ding and Morrison have genetically engineered mice to make a ‘reporter’ molecule—which glows green when viewed under a microscope—wherever and whenever the gene for Angpt1 is active. These experiments showed where the protein is produced, and unexpectedly revealed that the bone cells do not make Angpt1. Instead, it is the stem cells and the stromal cells in the niche that made the protein. Further experiments showed that deleting the gene for Angpt1 from mice, or just from their bone cells, did not affect blood cell production; nor did it affect the maintenance or regulation of the stem cells. Next, Zhou, Ding and Morrison looked at whether Angpt1 might be involved in rebuilding the niche after being exposed to radiation. Some of these irradiated mice had been genetically engineered to lack Angpt1; and, in these mice, blood stem cells and blood cell production recovered more quickly than in mice with Angpt1. The blood vessels in the niche also grew back more quickly in the irradiated mice that lacked Angpt1. However, these regenerated blood vessels were leaky. This suggests that blood stem cells produce Angpt1 to slow the recovery of the niche and reduce leakage from the blood vessels. Thus, blood stem cells can regulate the regeneration of the niches that maintain them. Hematopoietic stem cells (HSCs) reside in a specialized bone marrow niche in which Leptin Receptor+ (LepR+) perivascular stromal cells and endothelial cells secrete factors that promote their maintenance (Kobayashi et al., 2010; Ding et al., 2012; Ding and Morrison, 2013; Greenbaum et al., 2013; Poulos et al., 2013; Morrison and Scadden, 2014). Nearly all the cells that express high levels of Scf (Kitl) or Cxcl12 in the bone marrow are LepR+ (Zhou et al., 2014). Conditional deletion of Scf from LepR+ cells and endothelial cells leads to loss of all quiescent and serially-transplantable HSCs from adult bone marrow (Oguro et al., 2013). These LepR+ niche cells have also been identified based on their expression of high levels of Cxcl12 (Sugiyama et al., 2006; Ding and Morrison, 2013; Omatsu et al., 2014), low levels of the Nestin-GFP transgene (Mendez-Ferrer et al., 2010; Kunisaki et al., 2013), PDGFRα (Morikawa et al., 2009; Zhou et al., 2014), and Prx1-Cre (also known as Prrx1-Cre) (Greenbaum et al., 2013). Consistent with the conclusion that HSC niche cells include mesenchymal stem/stromal cells (Sacchetti et al., 2007; Mendez-Ferrer et al., 2010), the LepR+ cells are highly enriched for CFU-F and give rise to most of the osteoblasts and fat cells that form in adult bone marrow (Zhou et al., 2014). Angpt1 has been proposed to be expressed by osteoblasts in the bone marrow and to promote the maintenance of quiescent HSCs in an osteoblastic niche (Arai et al., 2004). However, HSCs and perivascular stromal cells also express Angpt1 (Takakura et al., 2000; Ivanova et al., 2002; Forsberg et al., 2005; Kiel et al., 2005; Sacchetti et al., 2007; Ding et al., 2012). Moreover, it has not been tested whether Angpt1 deficiency affects HSC function in vivo. Thus, the physiological function and sources of Angpt1 in the bone marrow remain uncertain. Angpt1 (Suri et al., 1996), and its receptor Tie2 (Dumont et al., 1994; Puri et al., 1995; Sato et al., 1995; Davis et al., 1996), are necessary for embryonic vascular development. Tie2 is mainly expressed by endothelial cells (Schnurch and Risau, 1993; Kopp et al., 2005) but also by HSCs (Iwama et al., 1993; Arai et al., 2004). Angpt1 over-expression promotes the development of larger, more numerous, more highly branched, and less leaky blood vessels (Suri et al., 1998; Thurston et al., 1999; Cho et al., 2005). Angpt1 expression by primitive hematopoietic progenitors (HPCs) promotes angiogenesis during embryonic development (Takakura et al., 2000). Global conditional deletion of Angpt1 between embryonic day (E)10.5 and E12.5 increases the size and number of blood vessels in fetal tissues but later deletion has little effect on vascular development (Jeansson et al., 2011). Nonetheless, Angpt1 does regulate angiogenesis in response to a variety of injuries in adult tissues (Kopp et al., 2005; Jeansson et al., 2011; Lee et al., 2013), promoting angiogenesis in some contexts (Thurston et al., 1999) while negatively regulating angiogenesis in other contexts (Visconti et al., 2002; Augustin et al., 2009; Jeansson et al., 2011; Lee et al., 2014). A key function of Angpt1 is to reduce the leakiness of blood vessels, perhaps by tightening junctions between endothelial cells (Thurston et al., 1999; Brindle et al., 2006; Lee et al., 2013, 2014). Irradiation and chemotherapy not only deplete HSCs but also disrupt their niche in the bone marrow, particularly the sinusoids (Knospe et al., 1966; Kopp et al., 2005; Li et al., 2008; Hooper et al., 2009) around which most HSCs (Kiel et al., 2005) as well as Scf-, Cxcl12-, and LepR-expressing stromal cells reside (Ding et al., 2012; Ding and Morrison, 2013; Omatsu et al., 2014; Zhou et al., 2014). Regeneration of this perivascular niche after injury, including endothelial and stromal components, is necessary for regeneration of HSCs and hematopoiesis (Kopp et al., 2005; Hooper et al., 2009). After 5-fluorouracil treatment, Tie2 signaling (which is regulated by its ligands Angpt1, Angpt2, and possibly Angpt3 [Augustin et al., 2009; Eklund and Saharinen, 2013; Fagiani and Christofori, 2013; Thomson et al., 2014]) regulates the remodeling of blood vessels in the bone marrow and adenoviral over-expression of Angpt1 accelerates the recovery of hematopoiesis (Kopp et al., 2005). This raises the question of whether endogenous Angpt1 is necessary for niche recovery and whether it acts by promoting HSC function in an osteoblastic niche or by regulating vascular regeneration. We first assessed the Angpt1 expression using a commercially available antibody to stain bone marrow sections. Most bone marrow cells did not stain positively and we were unable to detect any staining among bone-lining cells where osteoblasts localize (Figure 1A–C). The most prominent staining was in large CD41+ megakaryocytes (Figure 1D–F) and in c-kit+ HPCs (Figure 1G–I). Angpt1 was expressed by megakaryocytes and hematopoietic stem/progenitor cells in the bone marrow. (A–C) Immunostaining of femur sections from Col1a1*2.3-GFP mice with anti-Angpt1 antibody showed that Angpt1 was not detectably expressed by bone lining Col1a1*2.3-GFP+ osteoblasts. Nuclei were stained with DAPI (blue). (n = 3 mice from 3 independent experiments). (D–I) Representative femur sections from wild-type mice showed that anti-Angpt1 antibody stained CD41+ megakaryocytes (arrows, D–F) and c-kit+ hematopoietic progenitors (HPCs) (arrows, G–I) throughout the bone marrow. * in F indicates trabecular bone—note the lack of Angpt1 staining in bone-lining cells (n = 3 mice from 3 independent experiments). (J–O) Images of femur sections from Angpt1GFP mice showed that GFP was expressed by CD41+ megakaryocytes (arrows, J–L) and c-kit+ HPCs (arrows, M–O) (n = 3 mice from 3 independent experiments). (P–Y) Flow cytometric analysis of non-enzymatically dissociated Angpt1GFP bone marrow cells (which contains hematopoietic but few stromal cells) showed that GFP was rarely expressed by whole bone marrow (WBM) cells (P) or c-kit− cells (Q) but was expressed by most c-kit+ cells (R), CD150+CD48−LSK hematopoietic stem cells (HSCs) (S), CD150−CD48−LSK multipotent progenitor cells (MPPs) (T), CD48+LSK HPC cells (U), Flt3+IL7Rα+Lineage−Sca1lowc-kitlow common lymphoid progenitors (CLPs) (V), CD34+FcγR−Lineage−Sca1−c-kit+ common myeloid progenitor cells (CMPs) (W) and CD34+FcγR+Lineage−Sca1−c-kit+ granulocyte/macrophage progenitors (GMPs) (X). CD34−FcγR−Lineage−Sca1−c-kit+ megakaryocytic/erythroid progenitors (MEPs) expressed little GFP (Y). Data represent mean ± s.d. from 4 mice from 4 independent experiments. To analyze Angpt1 expression by flow cytometry, we generated Angpt1GFP knock-in mice by recombining GFP into the endogenous Angpt1 locus (Figure 1—figure supplement 1A–D). Consistent with the antibody staining pattern, GFP was expressed by CD41+ megakaryocytes (Figure 1J–L) and c-kit+ HPCs throughout bone marrow (Figure 1M–O). By flow cytometry, only 1.5 ± 0.8% of mechanically dissociated bone marrow cells (which include few stromal cells) were GFP+ (Figure 1P). Overall, 85% of GFP+ hematopoietic cells were c-kit+ (Figure 1—figure supplement 1E): 72 ± 13% of c-kit+ cells were GFP+ and only 1.3 ± 0.7% of c-kit− cells were GFP+ (Figure 1Q,R). All CD150+CD48−LSK HSCs expressed high levels of GFP (Figure 1S). All CD150−CD48−LSK multipotent progenitors (MPPs) were also positive for GFP, though at somewhat lower levels per cell than HSCs (Figure 1T). Virtually all CD48+LSK HPCs, Lineage−Sca1lowc-kitlowFlt3+IL7Rα+ common lymphoid progenitors (CLPs; Kondo et al., 1997), CD34+FcγR−Lineage−Sca1−c-kit+ common myeloid progenitors (CMPs; Akashi et al., 2000), and CD34+FcγR+Lineage−Sca1−c-kit+ granulocyte-monocyte progenitors (GMPs; Akashi et al., 2000) were GFP+ but with successively lower expression levels per cell relative to HSCs (Figure 1U–X). Few CD34−FcγR−Lineage−Sca1−c-kit+ megakaryocyte-erythroid progenitors (MEPs; Akashi et al., 2000) were positive for GFP (Figure 1Y). Angpt1 was thus broadly expressed by early HPCs, at levels that declined as progenitors matured. Virtually all of the Angpt1 expression by stromal cells in the bone marrow was by LepR+ cells. GFP+LepR+ stromal cells localized mainly around sinusoids throughout the bone marrow (Figure 2A–C) but were also present near arterioles (data not shown). GFP was expressed by 94 ± 3.2% of LepR+ stromal cells and 94 ± 2.5% of GFP+ stromal cells (CD45−Ter119−) were LepR+ (Figure 2F). Consistent with this, nearly all GFP+ stromal cells were PDGFRα+, a marker of mesenchymal stem/stromal cells (Morikawa et al., 2009) expressed by LepR+ bone marrow cells (Zhou et al., 2014). Nearly all PDGFRα+ cells were GFP+ (Figure 2G). Consistent with an earlier report (Sacchetti et al., 2007), this suggests that Angpt1 is widely expressed by mesenchymal stem/stromal cells in the bone marrow as LepR+ cells exhibit most of the CFU-F and osteogenic activity in adult mouse bone marrow (Zhou et al., 2014). We were unable to detect GFP expression by endothelial cells (Figure 2H), or by Osteopontin+ bone lining cells in the diaphysis (Figure 2D) or metaphysis (Figure 2E). Quantitative RT-PCR (qRT-PCR) analysis found that the highest levels of Angpt1 in the bone marrow were in HSCs (350-fold higher than whole bone marrow cells [WBM]), followed by LepR+ stromal cells (200-fold higher than WBM), LSK primitive HPCs (120-fold), c-kit+ HPCs (60-fold), and megakaryocytes (70-fold; Figure 2I). Angpt1 was expressed by Leptin Receptor+ (LepR+) perivascular stromal cells but not endothelial cells or osteoblasts in bone marrow. (A–C) Representative femur sections showed that LepR+ perivascular stromal cells (Tomato+) expressed GFP in Leprcre; tdTomato; Angpt1GFP mice. Endothelial cells were stained with anti-VE-cadherin antibody (blue) (n = 3 mice from 3 independent experiments). Note that Angpt1 expression in LepR+ cells is much easier to see in sections from GFP mice than in antibody stained sections. (D and E) Representative femur sections from Angpt1GFP mice showed that GFP was not detectably expressed by Osteopontin+ (red) osteoblasts in the diaphyseal (D) or metaphyseal (E) regions (n = 3 mice from 3 independent experiments). (F) In the bone marrow stroma from Leprcre; tdTomato; Angpt1GFP mice, nearly all LepR+ cells were positive for GFP, and vice versa. Data represent mean ± s.d. from 4 mice from 3 independent experiments. (G) In the bone marrow stroma from Angpt1GFP mice, nearly all PDGFRα+ cells were positive for GFP, and vice versa. Data represent mean ± s.d. from 4 mice in 3 experiments. (H) Bone marrow CD45−Ter119−VE-cadherin+ endothelial cells did not express detectable GFP (n = 3 mice from 3 independent experiments). (I and J) Angpt1 (I) and Tie2 (J) transcript expression levels by qRT-PCR of unfractionated bone marrow cells, HSCs, LSK cells, c-kit+ cells, EYFP+ cells from Leprcre; loxp-EYFP mice, CD41+ megakaryocytes, Col1a1*2.3-GFP+ osteoblasts, VE-cadherin+ bone marrow endothelial cells. All data represent mean ± s.d. from 3–8 mice/genotype in 3 independent experiments. Two-tailed Student's t-tests were used to assess statistical significance relative to unfractionated bone marrow cells (*p < 0.05, **p < 0.01, ***p < 0.001). Consistent with prior studies (Iwama et al., 1993; Schnurch and Risau, 1993; Arai et al., 2004; Kopp et al., 2005), qRT-PCR showed that the Angpt1 receptor, Tie2, was expressed most prominently by endothelial cells (167-fold higher than WBM) and HSCs (21-fold higher; Figure 2J). Tie2 protein was expressed by most c-kit+ HPCs and endothelial cells in normal adult bone marrow and after irradiation (Figure 6—figure supplement 2). To study Angpt1 function under physiological conditions in adult bone marrow, we generated a floxed allele of Angpt1 (Angpt1fl) (Figure 3—figure supplement 1A–C) and an Angpt1 deficient allele (Angpt1−) by recombining Angpt1fl in the germline using CMV-cre. Consistent with the embryonic lethal phenotype of two independent Angpt1 null alleles that were previously described (Suri et al., 1996; Jeansson et al., 2011), the mating of Angpt1+/− heterozygous mice did not lead to the birth of any Angpt1−/− pups (Figure 3—figure supplement 1D). Angpt1−/− embryos were found dead when timed pregnancies were examined at E12.5 (data not shown). Angpt1 transcripts could not be detected in the fetal livers of Angpt1−/− mice (Figure 3—figure supplement 1E). Thus, germline recombination of the Angpt1fl allele leads to a severe loss of Angpt1 function. We conditionally deleted Angpt1 from osteoblasts using Col1a1*2.3-cre; Angpt1fl/fl mice. Col1a1*2.3-cre recombines efficiently in fetal and postnatal osteoblasts (Liu et al., 2004; Ding et al., 2012). Col1a1*2.3-cre deleted 94 ± 3.0% of Angpt1fl alleles in Col1a1*2.3-GFP+ osteoblasts from Col1a1*2.3-cre; Angpt1fl/fl; Col1a1*2.3-GFP mice (Figure 3—figure supplement 2A). Ten to 13 week-old adult Col1a1*2.3-cre; Angpt1fl/fl mice had normal blood cell counts (Figure 3—figure supplement 2B), normal lineage composition in bone marrow, spleen and thymus (Figure 3—figure supplement 2C), and normal cellularity in the bone marrow, spleen and thymus (Figure 3A and Figure 3—figure supplement 2D). CD150+CD48−LSK HSC frequency was normal in the bone marrow and spleens of Col1a1*2.3-cre; Angpt1fl/fl mice relative to littermate controls (Figure 3B). Col1a1*2.3-cre; Angpt1fl/fl bone marrow cells also had normal frequencies of CLPs (Figure 3—figure supplement 2E), colony-forming progenitors in culture (Figure 3C) and dividing HSCs that incorporated BrdU (5'-bromo-2'-deoxyuridine) over 10 days in vivo (Figure 3D). Col1a1*2.3-cre; Angpt1fl/fl and control bone marrow cells gave rise to similar levels of long-term multilineage reconstitution upon transplantation into irradiated mice (Figure 3E). Angpt1 was dispensable for HSC maintenance and hematopoiesis. (A–E) Deletion of Angpt1 from osteoblasts using Col1a1*2.3-cre did not significantly affect bone marrow or spleen cellularity (A, n = 3 mice/genotype from 3 independent experiments), HSC frequency (B, n = 3 mice/genotype from 3 independent experiments), colony-forming progenitor frequency in bone marrow (C, n = 3 mice/genotype 3 independent experiments), incorporation of a 10-day pulse of BrdU by HSCs (D, n = 3 pairs of male mice and 3 pairs of female mice/genotype), or reconstituting capacity of bone marrow cells in a competitive reconstitution assay (E, n = 14–15 recipient mice/genotype from 3 independent experiments). (F–J) Leprcre; Angpt1GFP/fl mice had normal bone marrow and spleen cellularity (F, n = 4 mice/genotype from 4 independent experiments), HSC frequency in bone marrow and spleen (G, n = 5–6 mice/genotype from 5 independent experiments), colony-forming cell frequency in bone marrow (H, n = 3 mice/genotype from 3 independent experiments), BrdU incorporation into HSCs (I, n = 3 pairs of male mice and 3 pairs of female mice/genotype), and reconstituting capacity upon transplantation into irradiated mice (J, n = 13 recipient mice/genotype from 3 independent experiments). Angpt1fl/fl and Angpt1GFP/fl mice (lacking Cre) were indistinguishable and were therefore pooled together as controls. (K–O) Mx1-cre; Angpt1fl/fl mice had normal bone marrow and spleen cellularity (A, n = 3 mice/genotype), HSC frequency in bone marrow and spleen (K, n = 3 mice/genotype), colony-forming cell frequency in bone marrow (L, n = 6 mice/genotype from 4 independent experiments), BrdU incorporation into HSCs (M, n = 3 pairs of male mice and 3 pairs of female mice/genotype), and reconstituting capacity upon transplantation into irradiated mice (N, n = 10–14 recipient mice/genotype from 3 independent experiments). (P–S) Global deletion of Angpt1 in adult mice using UBC-Cre/ER (2–5 months after tamoxifen treatment) did not significantly affect cellularity in the bone marrow or spleen (P, n = 9–11 mice/genotype from 7 independent experiments), HSC frequency in the bone marrow (Q, n = 9–11 mice/genotype from 7 independent experiments), colony-forming progenitor frequency in bone marrow (R, n = 5 mice/genotype from 3 independent experiments), or reconstituting capacity of bone marrow cells upon transplantation into irradiated mice (S, n = 13–14 recipient mice/genotype from 3 independent experiments). Two-tailed Student's t-tests were used to assess statistical significance. See Figure 3—figure supplement 2 for data on recombination efficiency. To further test whether osteolineage progenitors are a source of Angpt1 for HSC maintenance, we deleted Angpt1 using Osx-Cre (Sp7-Cre) (Rodda and McMahon, 2006). Osx-Cre recombined 93% of Angpt1fl alleles from CD105+PDGFRα+CD45−Ter119−CD31− osteoprogenitors (Park et al., 2012) in Osx-cre; Angpt1fl/fl mice (Figure 4A). Osx-cre; Angpt1fl/fl mice also had normal blood cell counts (Figure 4B), normal cellularity, and HSC frequency in the bone marrow and spleen (Figure 4C,D), normal frequencies of colony-forming progenitors in culture (Figure 4E) and normal levels of long-term multilineage reconstitution upon transplanting bone marrow cells into irradiated mice (Figure 4F). Angpt1 from osteoblasts and their restricted progenitors are thus not required for hematopoiesis or HSC maintenance in normal adult mice. Angpt1 from osteoblast progenitors or Nestin-Cre-expressing cells is dispensable for HSC maintenance and hematopoiesis. (A) Osx-Cre recombined 93 ± 3.0% of Angpt1fl alleles in CD105+PDGFRα+CD45−Ter119−CD31− osteoprogenitors from Osx-cre; Angpt1fl/fl mice. Recombination efficiency was measured as described in Figure 3—figure supplement 2A (n = 3 mice from 3 independent experiments). (B–F) Osx-cre; Angpt1fl/fl mice had normal blood cell counts (B, n = 6 mice/genotype from 3 independent experiments), bone marrow and spleen cellularity (C, n = 6–7 mice/genotype from 6 independent experiments), HSC frequency in bone marrow and spleen (D, n = 4 mice/genotype from 4 independent experiments), colony-forming cell frequency in bone marrow (E, n = 5 mice/genotype from 5 independent experiments), and reconstituting capacity upon transplantation into irradiated mice (F, n = 23–24 recipient mice/genotype from 5 independent experiments). (G–K) Young adult Nestin-cre; Angpt1fl/fl mice had normal white blood cell counts, red blood cell counts, and platelet counts (G, n = 4 mice/genotype from 3 independent experiments), bone marrow and spleen cellularity (G, n = 4 mice/genotype from 3 independent experiments), HSC frequency (I, n = 4 mice/genotype from 3 independent experiments), colony-forming progenitor frequency in the bone marrow (J, n = 3 mice/genotype), and competitive reconstituting capacity upon transplantation into irradiated mice (K, n = 9–10 recipient mice/genotype from 2 independent experiments). Two-tailed Student's t-tests were used to assess statistical significance. To test whether Angpt1 from LepR+ stromal cells is required for HSC maintenance we generated Leprcre; Angpt1fl/fl or Leprcre; Angpt1fl/GFP mice. Lepr-Cre deleted 91% of Angpt1fl alleles in LepR+ bone marrow stromal cells from Leprcre; Angpt1fl/GFP mice (Figure 3—figure supplement 2F). At 8 to 13 weeks of age, Leprcre; Angpt1fl/GFP mice had normal blood cell counts (Figure 3—figure supplement 2G), normal lineage composition in bone marrow and spleen (data not shown), and normal cellularity in the bone marrow and spleen (Figure 3F). They also had normal frequencies of CD150+CD48−LSK HSCs in the bone marrow and spleen (Figure 3G), colony-forming progenitors in bone marrow (Figure 3H), and dividing HSCs (Figure 3I). Leprcre; Angpt1fl/GFP and control bone marrow cells gave rise to similar levels of long-term multilineage reconstitution upon transplantation into irradiated mice (Figure 3J). Angpt1 from LepR+ stromal cells is thus not required for hematopoiesis, HSC maintenance, or HSC quiescence in normal adult mice. Similar results were obtained from adult Nestin-cre; Angpt1fl/fl mice (Figure 4G–K). To test if Angpt1 expressed by hematopoietic cells regulates HSC function we generated Mx1-cre; Angpt1fl/fl mice. pIpC (polyinosinic-polycytidylic acid) was administered to mice at 2 months of age then the mice were examined 3 months later. We observed complete recombination in 98% of colonies formed by HSCs in culture (Figure 3—figure supplement 2H). Mx1-cre; Angpt1fl/fl mice had normal blood cell counts (Figure 3—figure supplement 2I), normal lineage composition in bone marrow and spleen (data not shown), and normal bone marrow and spleen cellularity (Figure 3K). Mx1-cre; Angpt1fl/fl mice also had normal frequencies of CD150+CD48−LSK HSCs in the bone marrow and spleen (Figure 3L), colony-forming progenitors in bone marrow (Figure 3M), and dividing HSCs that incorporated BrdU during a 10-day pulse (Figure 3N). Mx1-cre; Angpt1fl/fl and control bone marrow cells gave rise to similar levels of long-term multilineage reconstitution upon transplantation into irradiated mice (Figure 3O). Similar results were obtained when we conditionally deleted Angpt1 from fetal hematopoietic and endothelial cells by generating Tie2-cre; Angpt1fl/fl mice (Figure 5A–G) and when we conditionally deleted Angpt1 from megakaryocytes by generating Pf4-cre; Angpt1fl/fl mice (Figure 5H–K). Angpt1 from endothelial cells and hematopoietic cells, including megakaryocytes, is thus not required for hematopoiesis, HSC maintenance, or HSC quiescence in normal adult mice. Angpt1 from endothelial cells or megakaryocytes is dispensable for HSC maintenance and hematopoiesis. (A) Tie2-Cre recombined 97 ± 0.4% of Angpt1fl alleles in CD45+/Ter119+ hematopoietic cells and 97 ± 0.6% in VE-Cadherin+ endothelial cells from Tie2-cre; Angpt1fl/fl mice (measured as described in Figure 3—figure supplement 2A; n = 3 mice from 3 independent experiments). (B–G) Tie2-cre; Angpt1fl/fl mice had normal blood counts (B, n = 3–6 from 3 independent experiments), bone marrow and spleen cellularity (C, n = 5–10 mice/genotype from 4 independent experiments), HSC frequency in bone marrow and spleen (D, n = 5–10 mice/genotype from 4 independent experiments), colony-forming cell frequency in bone marrow (E, n = 3 mice/genotype from 3 independent experiments), vascular density and morphology (F, n = 3 mice/genotype from 3 independent experiments) and reconstituting capacity upon transplantation into irradiated mice (F, n = 8 recipient mice/genotype from 2 independent experiments). All data represent mean ± s.d. Two-tailed Student's t-tests were used to assess statistical significance. (H–K) Pf4-cre; Angpt1fl/fl mice had normal bone marrow and spleen cellularity (H, n = 5 mice/genotype from 4 independent experiments), HSC frequency in bone marrow and spleen (I, n = 5 mice/genotype from 4 independent experiments), colony-forming cell frequency in bone marrow (J, n = 5 mice/genotype from 5 independent experiments) and reconstituting capacity upon transplantation into irradiated mice (K, n = 14–15 recipient mice/genotype from 3 independent experiments). To globally delete Angpt1 we generated UBC-cre/ER; Angpt1fl/fl mice. UBC-Cre/ER ubiquitously recombines in adult mice upon tamoxifen administration (Ruzankina et al., 2007). We administrated tamoxifen-containing chow to 8-week old UBC-cre/ER; Angpt1fl/fl mice as well as littermate controls for 2–5 months then sacrificed them for analysis. UBC-cre/ER recombined 95% of Angpt1fl alleles in LSK cells and 96% of Angpt1fl alleles in LepR+ cells in the bone marrow of UBC-cre/ER; Angpt1fl/fl mice (Figure 3—figure supplement 2K). UBC-cre/ER; Angpt1fl/fl mice had normal blood cell counts (Figure 3—figure supplement 2L), normal bone marrow and spleen hematopoietic lineage composition (data not shown) and normal bone marrow and spleen cellularity relative to controls (Figure 3P). UBC-cre/ER; Angpt1fl/fl mice also had normal frequencies of CD150+CD48−LSK HSCs in the bone marrow and spleen (Figure 3Q), colony-forming progenitors in bone marrow (Figure 3R), and long-term multilineage reconstituting bone marrow cells upon transplantation into irradiated mice (Figure 3S). Angpt1 is thus dispensable for hematopoiesis and for the maintenance and function of HSCs in normal adult mice. We next tested whether Angpt1 regulates the recovery of hematopoiesis after irradiation. Since hematopoietic cells (HSCs, c-kit+ HPCs, and megakaryocytes) and LepR+ stromal cells were the major sources of Angpt1 in the bone marrow (Figures 1, 2) we reconstituted irradiated Leprcre; Angpt1fl/GFP or control recipients by transplanting 1 × 106 mechanically dissociated bone marrow cells from Mx1-cre; Angpt1fl/fl or control donors 1 month after pIpC treatment. This allowed us to test whether Angpt1 from LepR+ stromal cells and/or hematopoietic cells influenced the regeneration of hematopoiesis after irradiation. We did not detect significant changes in the patterns of Angpt1, Tie2, or Angpt2 expression in the bone marrow after irradiation and bone marrow transplantation (Figure 6—figure supplement 2). In both normal adult bone marrow, and after irradiation and transplantation, Tie2 was expressed primarily by endothelial cells and c-kit+ HPCs (Figure 6—figure supplement 2G) while Angpt2 was expressed primarily by endothelial cells. As expected, non-irradiated adult Leprcre; Angpt1fl/GFP mice, Mx1-cre; Angpt1fl/fl mice, and Leprcre; Mx1-cre; Angpt1fl/GFP mice all had normal bone marrow cellularity (Figure 6A), normal numbers of LSK cells in the bone marrow (Figure 6B), and normal CD150+CD48−LSK HSC frequency (Figure 6C). However, at 8 and 12 days after irradiation, Leprcre; Angpt1fl/GFP mice that had been transplanted with Mx1-cre; Angpt1fl/fl bone marrow cells, and to a significantly lesser extent Leprcre; Angpt1fl/GFP mice that had been transplanted with wild-type bone marrow cells, exhibited significantly higher bone marrow cellularity (Figure 6A) and significantly higher numbers of LSK cells in the bone marrow (Figure 6B) as compared to wild-type mice transplanted with wild-type bone marrow cells. At 16 days after irradiation, most of these differences persisted but by 28 days after irradiation mice in all treatments had similar bone marrow cellularities and LSK (Lineage−Sca1+c-kit+ cells) numbers (Figure 6A,B). The accelerated recovery of HPCs and hematopoiesis in the absence of Angpt1 was also evident in white blood cell counts and in the numbers of myeloid, lymphoid, and erythroid cells in the bone marrow (Figure 6—figure supplement 1). Angpt1 expression by hematopoietic cells and LepR+ stromal cells therefore negatively regulates the recovery of hematopoiesis after irradiation. Angpt1 deficiency in hematopoietic stem/progenitor cells and LepR+ stromal cells accelerated the recovery of HSCs and hematopoiesis after irradiation. One million bone marrow cells from Angpt1fl/fl (Cre−) or Mx1-cre; Angpt1fl/fl (Mx1) mice were transplanted into irradiated Angpt1fl/GFP or Angpt1GFP (Cre−) or Leprcre; Angpt1fl/GFP (Lepr) mice (all panels reflect mean ± s.d. from 6–11 mice/genotype/time point from 5 independent experiments). Bone marrow cellularity (A) and LSK cell numbers (B) were analyzed at the indicated time points after irradiation and transplantation, always in two femurs and two tibias per mouse. (C) Mx1-cre; Leprcre; Angpt1fl/GFP mice had a normal frequency of CD150+CD48−LSK HSCs in the bone marrow as compared to control (Angpt1fl/fl or Angpt1fl/GFP), Mx1-cre; Angpt1fl/fl, or Leprcre; Angpt1fl/GFP mice. (n = 6 mice/genotype from 5 independent experiments). (D) Competitive long-term multilineage reconstitution assay in which 1.5 × 106 donor bone marrow cells from the indicated primary recipient mice 12 days after irradiation were transplanted along with 3 × 105 recipient bone marrow cells into irradiated secondary recipient mice. The recipient cells were previously-transplanted compromised bone marrow cells. (n = 11–15 recipient mice/genotype from 3 independent experiments) Two-tailed Student's t-tests were used to assess statistical significance (* or #p < 0.05, ** or ##p < 0.01, *** or ###p < 0.001). * indicates statistical significance relative to Cre− control cells. # indicates statistical significance relative to Mx1 cells. (E and F) 4000 LSK cells from Angpt1fl/fl (Cre−) or Mx1-cre; Angpt1fl/fl (Mx1) mice were transplanted into irradiated Leprcre; Angpt1fl/GFP (Lepr) mice. Bone marrow cellularity (E) and LSK cell number in the bone marrow (F) were analyzed 14 and 28 days after irradiation and bone marrow transplantation. Data represent mean ± s.d. from 4 mice/genotype/time point from 3 independent experiments. Two-tailed Student's t-tests were used to assess statistical significance (*p < 0.05). (G and H) One million bone marrow cells from Angpt1fl/fl (Cre−) or Pf4-cre; Angpt1fl/fl (Pf4) mice were transplanted into irradiated Leprcre; Angpt1fl/GFP (Lepr) mice. Bone marrow cellularity (G) and LSK cell number in the bone marrow (H) were analyzed at 8, 12, 16, and 28 days after irradiation and transplantation. Data represent mean ± s.d. from 4 mice/genotype/time point from 3 independent experiments. Two-tailed Student's t-tests were used to assess statistical significance. We tested whether Angpt1 also influenced the expansion of HSC numbers after irradiation by transplanting WBMs from mice in each of the treatments described above at 12 days after transplantation. Bone marrow cells from Leprcre; Angpt1fl/GFP mice transplanted with Mx1-cre; Angpt1fl/fl bone marrow gave significantly higher levels of donor cell reconstitution in all lineages as compared to bone marrow cells from wild-type mice transplanted with wild-type bone marrow (Figure 6D). To a lesser extent, bone marrow cells from Leprcre; Angpt1fl/GFP mice that had been transplanted with wild-type bone marrow also gave significantly higher levels of donor cell reconstitution as compared to bone marrow cells from wild-type mice transplanted with wild-type bone marrow (Figure 6D). The expansion in HSC numbers during reconstitution is thus negatively regulated by Angpt1 expressed by hematopoietic cells and LepR+ stromal cells. 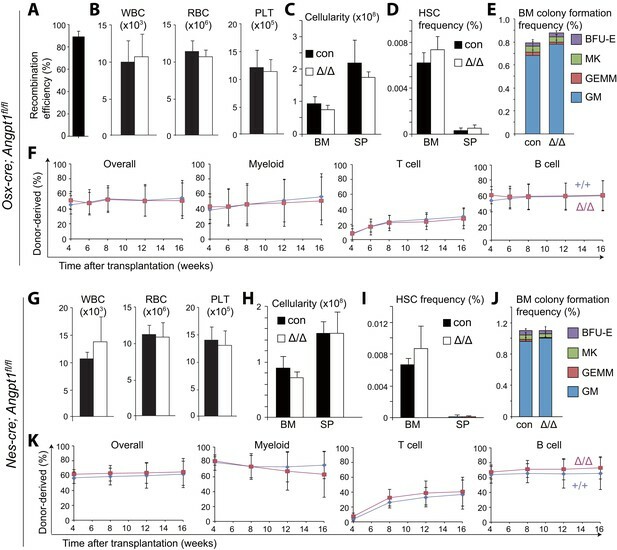 Since WBMs could potentially contain Angpt1-expressing stromal cells in addition to hematopoietic stem/progenitor cells and megakaryocytes we undertook a series of additional experiments to test whether hematopoietic stem/progenitor cells are a functionally important source of Angpt1 for hematopoietic regeneration. First, we transplanted 4000 LSK (Lineage−Sca-1+c-kit+) cells from control or Mx1-cre; Angpt1fl/fl mice into Leprcre; Angpt1GFP/fl mice to test the effects of HPCs uncontaminated by stromal cells on hematopoietic regeneration after irradiation. We found that the mice transplanted with Angpt1 deficient LSK cells had significantly higher bone marrow cellularity (Figure 6E) and LSK cell numbers (Figure 6F) than mice transplanted with control LSK cells at 14 days after irradiation. These data prove that Angpt1 expression by hematopoietic cells regulates hematopoietic recovery after irradiation. The only hematopoietic cells other than c-kit+ hematopoietic stem and progenitor cells that express Angpt1 are megakaryocytes (Figure 1D–F,J–L). To test whether Angpt1 expression by megakaryocytes contributes to the regulation of hematopoietic recovery we conditionally deleted Angpt1 from megakaryocyte lineage cells using Pf4-Cre and transplanted WBMs from control and Pf4-cre; Angpt1fl/fl mice into Leprcre; Angpt1GFP/fl recipients. We did not detect any significant differences in hematopoietic recovery between mice transplanted with control vs Pf4-cre; Ang1fl/fl bone marrow (Figure 6G,H). These data indicate that Angpt1 expression by megakaryocyte lineage cells has little effect on hematopoietic recovery after irradiation. Together, our data demonstrate that Angpt1 expression by hematopoietic stem and progenitor cells and LepR+ stromal cells regulate hematopoietic recovery after irradiation. Consistent with a prior study (Jeansson et al., 2011), loss of Angpt1 expression in the bone marrow had no detectable effect on the bone marrow vasculature in normal young adult mice. 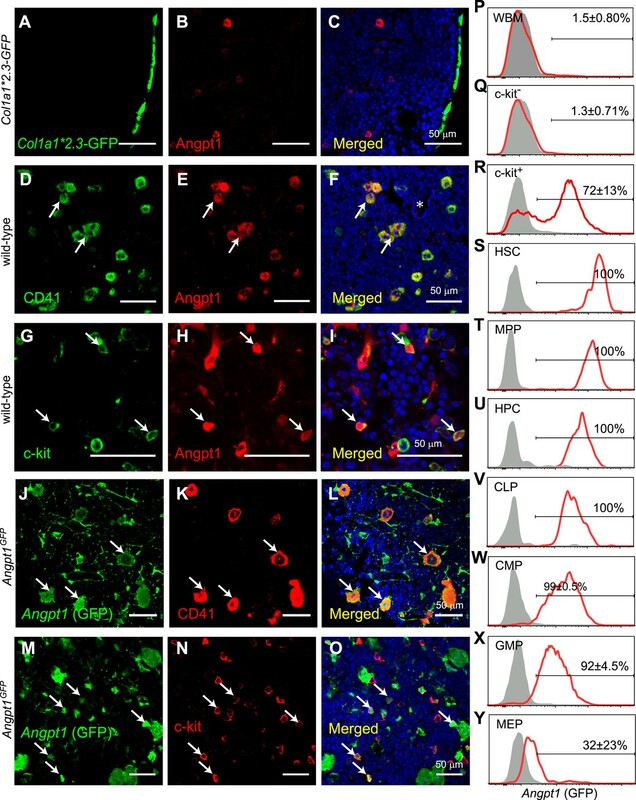 Deletion of Angpt1 from hematopoietic cells in Mx1-cre; Angpt1fl/fl mice, or perivascular stromal cells in Leprcre; Angpt1fl/GFP mice, or both in Mx1-cre; Leprcre; Angpt1fl/GFP mice, did not affect the numbers of VE-cadherin+ endothelial cells or LepR+ perivascular cells in the bone marrow (Figure 7A,B), or the density or morphology of the vasculature in bone marrow relative to control mice (Figure 7—figure supplement 1A). Angpt1 deficiency in hematopoietic stem/progenitor cells and LepR+ stromal cells increased endothelial cell proliferation and accelerated the recovery of vascular morphology after irradiation. (A and B) Deletion of Angpt1 from hematopoietic cells (Mx1), LepR+ stromal cells (Lepr), or both (Lepr and Mx1) did not significantly affect the number of VE-cadherin+ endothelial cells (A) or LepR+ perivascular stromal cells (B) in the bone marrow of normal young adult mice. Cell number in enzymatically dissociated bone marrow cells was determined in 2 pairs of femurs and tibias per mouse (n = 3 mice/genotype from 3 independent experiments). (C and D) Representative images showing normal (C) and regressed (D) sinusoids in transverse femur sections. Regressed sinusoids were distinguished from non-regressed sinusoids by being dilated and having few hematopoietic cells around them. (E–K) One million bone marrow cells from Angpt1fl/fl (Cre−) or Mx1-cre; Angpt1fl/fl (Mx1) mice were transplanted into irradiated Angpt1fl/GFP or Angpt1GFP (Cre−) or Leprcre; Angpt1fl/GFP (Lepr) mice. Three-dimensional reconstructions of 50 μm thick sections of femoral bone marrow stained with anti-VE-cadherin antibody revealed the regression and regeneration of blood vessels after irradiation. Representative images for control (Cre−) mice were taken at steady state (E), 8 days (F), 12 days (G), 16 days (H) and 28 days (I) after irradiation and transplantation. Representative images for Mx1 → Cre−, Cre− → Lepr and Mx1 → Lepr mice were taken 12 days after irradiation (G). (J) The percentage of regressed sinusoids in sections through the bone marrow. Data represent mean ± s.d. from 5–6 mice/genotype/time point from 4 independent experiments. (K) Incorporation of a 24-hr pulse of BrdU into VE-cadherin+ endothelial cells (mean ± s.d. from 3–4 mice/genotype/time from 3 experiments). Two-tailed Student's t-tests were used to assess statistical significance (* or #p < 0.05; ** or ##p < 0.01; *** or ###p < 0.001). (L and M) 4000 LSK cells from Angpt1fl/fl (Cre−) or Mx1-cre; Angpt1fl/fl (Mx1) mice were transplanted into irradiated Leprcre; Angpt1fl/GFP (Lepr) mice. Vascular morphology (M) and the percentage of regressed sinusoids (L) were analyzed at the indicated time points. (N and O) One million bone marrow cells from Angpt1fl/fl (Cre−) or Pf4-cre; Angpt1fl/fl (Pf4) mice were transplanted into irradiated Leprcre; Angpt1fl/GFP (Lepr) mice. Vascular morphology (O) and the percentage of regressed sinusoids (N) were analyzed at the indicated time points. Two-tailed Student's t-tests were used to assess statistical significance (*p < 0.05). 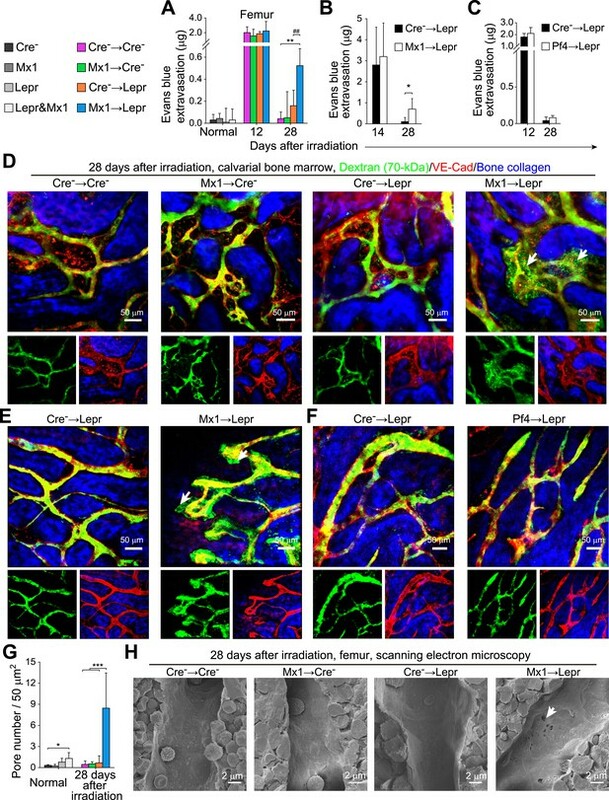 Irradiation induces vascular regression followed by regeneration from surviving endothelial cells (Heissig et al., 2005; Kopp et al., 2005; Li et al., 2008; Hooper et al., 2009). Consistent with this we observed dilated regressed sinusoids throughout the bone marrow 8 days after irradiation and bone marrow transplantation (compare Figure 7C–F,J). Few hematopoietic cells clustered around these regressed sinusoids relative to normal bone marrow (compare Figure 7C–F). Morphologically normal, hematopoietic cell-invested sinusoids were evident in some areas of the bone marrow 12 days after transplantation (Figure 7G,J), and their frequency increased 16 days after transplantation (Figure 7H,J). By day 28, regressed vessels were no longer observed in the bone marrow in any treatment (Figure 7I,J). When Mx1-cre; Angpt1fl/fl bone marrow cells were transplanted into wild-type recipients (Mx1 → Cre−), vascular recovery was indistinguishable from control mice (Cre− → Cre−) (Figure 7G,J and Figure 7—figure supplement 1). However, when wild-type bone marrow cells were transplanted into Leprcre; Angpt1fl/GFP recipients (Cre− → Lepr) we observed accelerated morphological recovery of the vasculature, with significantly fewer dilated regressed vessels at 12 and 16 days after transplantation relative to control mice (Figure 7G,J and Figure 7—figure supplement 1C). The accelerated recovery was significantly more pronounced when we transplanted Mx1-cre; Angpt1fl/fl bone marrow cells into Leprcre; Angpt1fl/GFP recipients (Mx1 → Lepr). These mice exhibited significantly fewer regressed vessels at 12 and 16 days after transplantation relative to control mice and Cre− → Lepr mice (Figure 7G,J and Figure 7—figure supplement 1C). 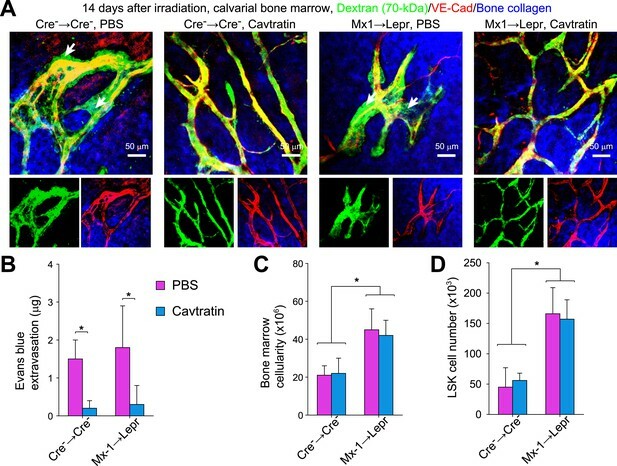 By 28 days after irradiation mice in all treatments had reacquired morphologically normal bone marrow vasculature (Figure 7I,J and Figure 7—figure supplement 1D). These data indicate that Angpt1 produced by hematopoietic cells and LepR+ stromal cells slows the morphological recovery of blood vessels after irradiation. When combined with the observation that Angpt1 also slows the regeneration of HSCs (Figure 6B,D) and bone marrow hematopoiesis (Figure 6A) after irradiation, the data indicate that Angpt1 negatively regulates the regeneration of the HSC niche in bone marrow after irradiation. We transplanted 4000 LSK cells from control and Mx1-cre; Angpt1fl/fl mice into Leprcre; Angpt1GFP/fl mice to test the effects of HPCs uncontaminated by stromal cells on vascular regeneration after irradiation. We found that the mice transplanted with Angpt1 deficient LSK cells had significantly better vascular morphology in the bone marrow (Figure 7L,M) than mice transplanted with control LSK cells at 14 days after irradiation. To test whether Angpt1 expression by megakaryocytes contributed to the vascular recovery we transplanted WBMs from control and Pf4-cre; Angpt1fl/fl mice into Leprcre; Angpt1GFP/fl recipients. We did not detect any significant differences in vascular recovery between mice transplanted with control vs Pf4-cre; Ang1fl/fl bone marrow (Figure 7N,O). Angpt1 expression by hematopoietic stem and progenitor cells and LepR+ stromal cells therefore regulate both hematopoietic and vascular recovery after irradiation. To investigate the cellular mechanism by which Angpt1 influences vascular recovery after irradiation we assessed the proliferation of bone marrow endothelial cells. In normal adult bone marrow few endothelial cells incorporated a 24-hr pulse of BrdU and deletion of Angpt1 from hematopoietic cells, LepR+ cells, or both did not influence this frequency (Figure 7K). After irradiation and bone marrow transplantation, endothelial cells were recruited into cycle (Figure 7K). Deletion of Angpt1 from hematopoietic cells and LepR+ cells significantly increased the frequency of dividing endothelial cells 12 days after transplantation (Figure 7K). These data suggest that Angpt1 slows the recovery of the vasculature and the HSC niche partly by negatively regulating the proliferation of endothelial cells after irradiation. To test whether Angpt1 regulates vascular leakiness in the bone marrow we assessed Evans blue extravasation. Evans blue binds to serum albumin and can be used to trace macromolecule flux across blood vessels (Radu and Chernoff, 2013). In normal bone marrow we observed little Evans blue extravasation, irrespective of whether Angpt1 was deleted from hematopoietic cells, LepR+ cells, or both (Figure 8A), suggesting that Angpt1 is dispensable for maintaining vascular integrity in normal adult bone marrow. In contrast, 12 days after irradiation we observed uniformly high levels of Evans blue extravasation in bone marrow from mice in all treatments (Figure 8A and Figure 8—figure supplement 1A), consistent with the leakiness that would be expected from regenerating blood vessels (Hooper et al., 2009). When morphological recovery of bone marrow vessels was complete 28 days after irradiation (Figure 7J and Figure 7—figure supplement 1D), control mice (Cre− → Cre−) and wild-type mice transplanted with Angpt1 deficient bone marrow cells (Mx1 → Cre−) had largely re-established vascular integrity, with little Evans blue extravasation (Figure 8A). Leprcre; Angpt1fl/GFP mice transplanted with wild-type bone marrow cells (Cre− → Lepr) showed a trend toward increased Evans blue extravasation but the effect was not statistically significant relative to control mice (Figure 8A). In contrast, Leprcre; Angpt1fl/GFP mice transplanted with Angpt1 deficient bone marrow cells (Mx1 → Lepr) exhibited significantly higher levels of Evans blue extravasation at 28 days after transplantation (Figure 8A). Leaky vasculature was not observed in the spleen (Figure 8—figure supplement 1B). Angpt1 from hematopoietic cells and LepR+ stromal cells is thus required to promote vascular integrity in the bone marrow after regeneration at the expense of slowing endothelial cell proliferation and the morphological recovery of blood vessels, slowing the regeneration of the HSC niche. Angpt1 deficiency in hematopoietic stem/progenitor cells and LepR+ stromal cells increases the leakiness of regenerated blood vessels. One million bone marrow cells from Angpt1fl/fl (Cre−) or Mx1-cre; Angpt1fl/fl (Mx1) mice were transplanted into lethally irradiated Angpt1GFP/fl or Angpt1GFP (Cre−) or Leprcre; Angpt1GFP/fl (Lepr) mice (A, D, H) (n = 4 mice/genotype/time point from 3 independent experiments). 4000 LSK cells Angpt1fl/fl (Cre−) or Mx1-cre; Angpt1fl/fl (Mx1) mice were transplanted into Leprcre; Angpt1GFP/fl mice (Lepr) (B and E) (n = 4 mice/genotype/time point from 3 independent experiments). One million bone marrow cells from Angpt1fl/fl (Cre−) or Pf4-cre; Angpt1fl/fl (Pf4) were transplanted into Leprcre; Angpt1GFP/fl (Lepr) mice (C and F) (n = 4 mice/genotype/time point from 3 independent experiments). (A–C) Extravasation of intravenously injected Evans blue into femoral bone marrow at the indicated time points after irradiation and bone marrow transplantation. (D–F) Live imaging of calvarial bone marrow at 28 days after irradiation and bone marrow transplantation to assess dextran-FITC extravasation (arrows). The mice were injected with dextran-FITC and anti-VE-cadherin antibody before microscopy. (G) Quantification of the number of pores larger than 100 nm in diameter per 50 µm2 of sinusoidal endothelium (n = 3–5 mice/genotype from 3 independent experiments). Two-tailed Student's t-tests were used to assess statistical significance (* or #, p < 0.05; ** or ##, p < 0.01; *** or ###, p < 0.001). (H) Scanning electron microscopy of bone marrow sinusoids from Cre− → Cre−, Mx1 → Cre−, Cre− → Lepr, and Mx1 → Lepr mice at 28 days after irradiation. Arrows indicate pores greater than 100 nm in diameter in sinusoidal endothelium 28 days after irradiation. To independently assess vascular integrity, we performed live imaging of the vasculature in the calvarium bone marrow of mice intravenously administered anti-VE-cadherin antibody and dextran-FITC (70 kDa). In normal mice, dextran-FITC fluorescence was tightly restricted within VE-cadherin+ vessels (Figure 8—figure supplement 1C). 12 days after irradiation, calvarium blood vessels became dilated and dextran-FITC leaked throughout the medullary cavity (Figure 8—figure supplement 1D). At 28 days after transplantation, control mice (Cre− → Cre−), wild-type mice transplanted with Angpt1 deficient hematopoietic cells (Mx1 → Cre−), and Leprcre; Angpt1fl/GFP mice transplanted with wild-type bone marrow cells (Cre− → Lepr) all exhibited vascular integrity, with little discernible leakage of dextran-FITC (Figure 8D). In contrast, Leprcre; Angpt1fl/GFP mice transplanted with Angpt1 deficient bone marrow cells (Mx1 → Lepr) exhibited leaky vessels in the calvarium with dextran-FITC infiltrating the bone marrow (Figure 8D, see arrows). Thus, consistent with the Evans blue assay, Angpt1 from hematopoietic cells and LepR+ cells promotes bone marrow vascular integrity during regeneration. We transplanted 4000 LSK cells from control and Mx1-cre; Angpt1fl/fl mice into Leprcre; Angpt1GFP/fl mice to test the effects of HPCs uncontaminated by stromal cells on vascular integrity after irradiation. The mice transplanted with Angpt1 deficient, but not control, LSK cells exhibited vascular leakage in the bone marrow 28 days after irradiation, as evidenced by high level of Evans blue and Dextran-FITC extravasation (Figure 8B,E). To test whether Angpt1 expression by megakaryocytes contributed to the vascular integrity we transplanted WBMs from control and Pf4-cre; Angpt1fl/fl mice into Leprcre; Angpt1GFP/fl recipients. We did not detect any significant differences in vascular leakiness between mice transplanted with control vs Pf4-cre; Ang1fl/fl bone marrow (Figure 8C,F). Angpt1 expression by hematopoietic stem and progenitor cells and LepR+ stromal cells therefore promotes vascular integrity during regeneration after irradiation. We performed scanning electron microscopy to better understand the loss of blood vessel integrity after Angpt1 deletion. Normal bone marrow sinusoids were 5–20 µm in luminal diameter (Figure 8—figure supplement 1E). They could be readily distinguished from bone marrow arterioles, which had thicker walls and a different morphology (Figure 8—figure supplement 1G). At 8–16 days after irradiation, sinusoid diameter in the bone marrow increased (compare Figure 8—figure supplement 1E,F) and the endothelial lining was marked by small pores (Figure 8—figure supplement 1F), consistent with the finding that irradiation causes discontinuities in bone marrow blood vessels (Daldrup et al., 1999). At 28 days after irradiation, pores were rare in sinusoids from wild-type mice transplanted with wild-type marrow (Cre− → Cre−), wild-type mice transplanted with Angpt1 deficient bone marrow (Mx1 → Cre−), and Leprcre; Angpt1fl/GFP mice transplanted with wild-type bone marrow (Cre− → Lepr) (Figure 8G,H), consistent with the integrity of vessels in these mice. In contrast, pores remained common in blood vessels in bone marrow from Leprcre; Angpt1fl/GFP mice transplanted with Angpt1 deficient bone marrow cells (Mx1 → Lepr) (Figure 8H, see arrow; Figure 8G). These data suggest that in the absence of Angpt1, vascular integrity is reduced in regenerating bone marrow blood vessels because of the persistence of pores or discontinuities among endothelial cells. To test whether the accelerated hematopoietic recovery in the absence of Angpt1 is caused by the increase in vascular leakiness we treated mice with cavtratin, an anti-permeability agent unrelated to Angpt1 function (Gratton et al., 2003). We injected cavtratin (2.5 mg/kg/day i.p.) into control (control bone marrow transplanted into control mice) and Mx1 → Lepr recipients from 7 to 13 days after irradiation then analyzed the mice 14 days after irradiation and bone marrow transplantation. Based on both Dextran-FITC live-imaging and Evans blue extravasation, cavtratin significantly reduced vascular leakiness in both control and Mx1 → Lepr recipient mice (Figure 9A,B). However, cavtratin administration did not significantly affect the recovery of bone marrow cellularity or LSK cell numbers in the bone marrow of control or Mx1 → Lepr recipients (Figure 9C,D). 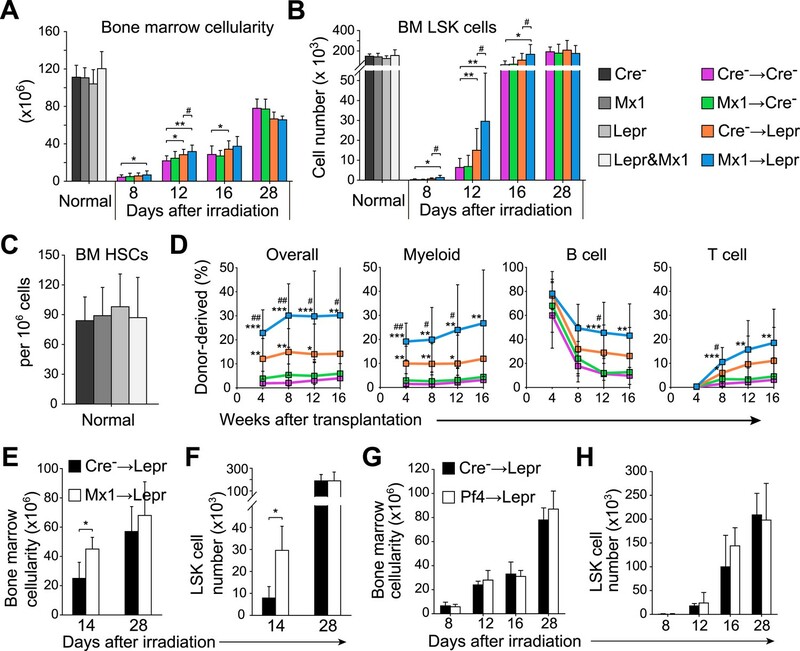 Mx1 → Lepr recipients continued to regenerate bone marrow cellularity and LSK cell numbers significantly faster than control mice, irrespective of cavtratin treatment. The accelerated recovery of hematopoietic stem/progenitor cells and hematopoiesis in the absence of Angpt1 is therefore not caused by increased vascular leakiness. These appear to reflect independent effects of Angpt1. Vascular leakage does not promote hematopoietic regeneration in Angpt1 mutant mice. One million whole WBMs from control and Mx1-cre; Angpt1fl/fl mice were transplanted into irradiated control and Leprcre; Angpt1GFP/fl mice, respectively. Cavtratin was administered into control (Cre− → Cre−), and mutant (Mx1 → Lepr) recipients from 7 to 13 days after irradiation and transplantation. 14 days after irradiation mice were analyzed for Dextran-FITC extravasation in calvarial bone marrow (A, n = 3 mice/genotype from 3 independent experiments), Evans blue extravasation in femoral bone marrow (B, n = 3 mice/genotype from 3 independent experiments), bone marrow cellularity, and LSK cell number in the bone marrow (C and D, n = 4 mice/genotype from 3 independent experiments). Cell numbers reflect two femurs and two tibias. Two-tailed Student's t-tests were used to assess statistical significance (*p < 0.05). Several gene-expression profiling studies are consistent with our finding that HSCs are a major source of Angpt1 (Ivanova et al., 2002; Akashi et al., 2003; Forsberg et al., 2010; Cabezas-Wallscheid et al., 2014). In addition, an Angpt1-LacZ knockin allele is expressed in an HSC-enriched population (Takakura et al., 2000). Several prior studies have also demonstrated that perivascular stromal cells are a significant source of Angpt1 in the bone marrow (Sacchetti et al., 2007; Mendez-Ferrer et al., 2010; Ding et al., 2012). In contrast, we have been unable to detect Angpt1 expression in osteoblasts in Angpt1GFP knock-in mice (Figure 2D,E), by anti-Angpt1 antibody staining (Figure 1A–C), by qRT-PCR on sorted cells (Figure 2I), or by gene-expression profiling of osteoblasts (data not shown). Megakaryocytes also express Angpt1 (Figure 1J–L) but unlike deletion in hematopoietic stem/progenitor cells and LepR+ stromal cells, conditional deletion in megakaryocyte lineage cells did not affect hematopoietic or vascular regeneration after irradiation (Figures 6–9). Thus, hematopoietic stem/progenitor cells and LepR+ stromal cells are the functionally important sources of Angpt1 in the bone marrow. Tie1 and Tie2 are the receptors for Angpt1, Angpt2, and possibly Angpt3 (Augustin et al., 2009; Eklund and Saharinen, 2013; Fagiani and Christofori, 2013; D'Amico et al., 2014; Thomson et al., 2014). Tie1 is not required for the development or maintenance of fetal liver or adult bone marrow HSCs (Corash et al., 1989; Rodewald and Sato, 1996). Tie1/Tie2 double knockout ES cells contribute to fetal but not adult hematopoiesis (Puri and Bernstein, 2003). Given that Angpt1 is not required for the maintenance of adult hematopoiesis, some combination of Angpt2 and Angpt3 may be required for adult hematopoiesis. Global Angpt1 deletion (Figure 3P–S), deletion from osteoblasts and their progenitors (Figure 3A–E and Figure 4A–F), or deletion from hematopoietic and/or LepR+ stromal cells (Figure 3F–O), did not affect HSC frequency or HSC function in normal adult mice. Angpt1 deletion from these cell populations had little effect on the bone marrow vasculature in normal adult mice (Figures 7, 8). We observed only rare pores in sinusoidal epithelium from Leprcre; Mx1-cre; Angpt1fl/GFP mice (Figure 8G,H) and virtually no Evans blue leakage (Figure 8A). In contrast, Angpt1 deletion from LepR+ stromal cells and hematopoietic cells had much larger effects on the regeneration of the vasculature and the HSC niche after irradiation. Angpt1 deficiency from these cell populations accelerated the recovery of hematopoiesis (Figure 6A), the regeneration of LSK cells (Figure 6B), the regeneration of long-term multilineage reconstituting HSCs (Figure 6D), the proliferation of endothelial cells (Figure 7K), and the morphological recovery of bone marrow blood vessels (Figure 7E–J and Figure 7—figure supplement 1). However, Angpt1 deficiency also increased the leakiness of the regenerated blood vessels (Figure 8A,D) by allowing pores to persist in sinusoidal endothelium (Figure 8G,H). Together, the data indicate that Angpt1 produced by LepR+ stromal cells and hematopoietic cells promotes vascular integrity in regenerating blood vessels in the bone marrow at the cost of slowing the regeneration of HSC niches and hematopoiesis. Targeting vectors for generating Angpt1GFP and Angpt1fl/+ mice were constructed by recombineering (Liu et al., 2003). Linearized targeting vectors were electroporated into Bruce4 ES cells. Corrected targeted ES cell clones were identified by Southern blotting and injected into C57BL/6-Tyrc-2J blastocysts. The resulting chimeric mice were bred with C57BL/6-Tyrc-2J mice to obtain germline transmission. Then the Frt-Neo-Frt cassette introduced by the targeting vector was removed by mating with Flpe mice (Rodriguez et al., 2000). These mice were backcrossed onto a C57BL/Ka background. Other mice used in this study were: Col1a1*2.3-cre (Liu et al., 2004), Leprcre (DeFalco et al., 2001), Osx-cre (Rodda and McMahon, 2006), Nestin-cre (Tronche et al., 1999), Pf4-cre (Tiedt et al., 2007), Tie2-cre (Koni et al., 2001), Mx1-cre (Kühn et al., 1995), UBC-cre/ER (Ruzankina et al., 2007), Col1a1*2.3-GFP (Kalajzic et al., 2002), Loxp-EYFP (Srinivas et al., 2001), and Loxp-tdTomato (Madisen et al., 2010). For induction of UBC-Cre/ER, Tamoxifen chow (Harlan, Indianapolis, IN) containing tamoxifen citrate at 40 mg/kg, with 5% sucrose, was administrated to mice for 2–5 months before analysis. C57BL/6-SJL (CD45.1) mice were used as recipients in transplantation experiments unless otherwise indicated. All mice were housed at the Unit for Laboratory Animal Medicine at the University of Michigan or in the Animal Resource Center at the University of Texas Southwestern Medical Center. All protocols were approved by the University of Michigan Committee on the Use and Care Animals and by the University of Texas Southwestern Institutional Animal Care and Use Committee. The following primers were used for genotyping. For Angpt1GFP, OLD308: 5′-gggaaagagtcaaacaagcag-3′ OLD309: 5′-aaccgaaagcgatcacttac-3′ and OLD292: 5′-cggacacgctgaacttgtgg-3′. For Angpt1fl, OLD335: 5′-ggactcaacttcctgggtaagc-3′ and OLD336: 5′-ggctttgacagtcaaaatgcc-3′. For Angpt1−, OLD3111: 5′-cagggttggcataaaatttgc-3′ and OLD350: 5′-tcctggtctttgcacttgactg-3′. Cells were directly sorted into Trizol. Total RNA was extracted per the manufacture's instructions. SuperScript III (Lifetech, Grand Island, NY) was used to generate cDNA. Quantitative real-time PCR was performed using SYBR green on a LightCycler 480 or Stepone Plus. β-actin amplification was used to normalize the transcript content of samples. Primers used in this study were: Angpt1: OLD7: 5′-gggggaggttggacagtaat-3′ and OLD8: 5′-catcagctcaatcctcagca-3′. Tie2: forward: 5′-gattttggattgtcccgaggtcaag-3′ and reverse: 5′-caccaatatctgggcaaatgatgg-3′. β-actin: OLD27: 5′-gctcttttccagccttcctt-3′ OLD28: 5′-cttctgcatcctgtcagcaa-3′. Cells were sorted or directly pipetted into methylcellulose culture medium (3434, Stemcell Technologies, Vancouver, BC, Canada) and incubated at 37°C for 14 days in a humidified chamber. Bone marrow cells were isolated by flushing or by crushing the long bones with a mortar and pestle in Ca2+ and Mg2+ free HBSS with 2% heat-inactivated bovine serum. Spleen cells were obtained by crushing the spleen between two glass slides. The cells were dissociated to a single cell suspension by gently passing through a 25G needle then filtering through a 70 µm nylon mesh. The following antibodies were used to isolate HSCs: anti-CD150 (TC15-12F12.2), anti-CD48 (HM48-1), anti-Sca1 (E13-161.7), anti-c-kit (2B8), and the following antibodies against lineage markers (anti-Ter119, anti-B220 [6B2], anti-Gr1 [8C5], anti-CD2 [RM2-5], anti-CD3 [17A2], anti-CD5 [53-7.3], and anti-CD8 [53-6.7]). HPCs were identified by flow cytometry using the following antibodies: anti-Sca1 (E13-161.7), anti-c-kit (2B8), and the following antibodies against lineage markers (anti-Ter119, anti-B220 [6B2], anti-Gr1 [8C5], anti-CD2 [RM2-5], anti-CD3 [17A2], anti-CD5 [53-7.3] and anti-CD8 [53-6.7]), anti-CD34 (RAM34), anti-CD135 (Flt3) (A2F10), anti-CD16/32 (FcγR) (93), anti-CD127 (IL7Rα) (A7R34), anti-CD24 (M1/69), anti-CD43 (1B11), anti-B220 (6B2), anti-IgM (II/41), anti-CD3 (17A2), anti-Gr1 (8C5), anti-Mac1 (M1/70), anti-CD41 (MWReg30), anti-CD71 (C2), anti-Ter119, anti-CD44 (IM7) and anti-CD25 (PC61). DAPI was used to exclude dead cells. Unless otherwise indicated, antibodies were obtained from eBioscience (San Diego, CA) or BD Bioscience (San Jose, CA). For flow cytometric analysis of bone marrow stromal cells, bone marrow was flushed using HBSS with 2% bovine serum. Then, whole bone marrow was digested with DNase I (200 U/ml) and Collagenase IV (200 U/ml) or liberase (Roche, San Francisco, CA) at 37°C for 15 min. Samples were then stained with antibodies and analyzed by flow cytometry. Anti- PDGFRα (APA5), anti-CD45 (30F-11), anti-CD31 (390), and anti-Ter119 antibodies were used to isolate perivascular stromal cells. For analysis of bone marrow endothelial cells, mice were i.v. injected with 10 µg/mouse Alexa Fluor 647 conjugated anti-VE-cadherin antibody (BV13, eBiosciences) (Butler et al., 2010). 10 min later, the long bones were removed and bone marrow was flushed, digested, and stained as above. Samples were analyzed using a FACSAria or FACSCanto II flow cytometer (BD Biosciences). Data were analyzed by FACSDiva (BD Biosciences) or FlowJo (Tree Star) software. Adult recipient mice were lethally irradiated by a Cesium 137 GammaCell40 Irradiator (MDS Nordia) or an XRAD 320 x-ray irradiator (Precision X-Ray Inc., North Branford, CT) with two doses of 540 rad (total 1080 rad) delivered at least 2 hr apart. Cells were transplanted intravenously into the retro-orbital venous sinus of anesthetized mice. 3 × 105 bone marrow cells were transplanted together with 3 × 105 recipient type competitor cells unless otherwise noted. Mice were maintained on antibiotic water (neomycin sulfate 1.11 g/l and polymixinB 0.121 g/l) for 14 days then switched to regular water. Recipient mice were periodically bled to assess the level of donor-derived blood cells, including myeloid, B and T cells for at least 16 weeks. Blood was subjected to ammonium chloride/potassium red cell lysis before antibody staining. Antibodies including anti-CD45.2 (104), anti-CD45.1 (A20), anti-Gr1 (8C5), anti-Mac-1 (M1/70), anti-B220 (6B2), and anti-CD3 (KT31.1) were used to stain cells for analysis by flow cytometry. For BrdU incorporation assays, mice were given an intraperitoneal injection of 1 mg BrdU (Sigma, St. Louis, MO) per 6 g of body mass in PBS (Phosphate Buffered Saline) and maintained on 1 mg/ml of BrdU in the drinking water for 24 hr (endothelial cells) or 10 days (HSCs). Bone marrow endothelial cells were pre-stained by i.v. injection of Alexa Fluor 555 conjugated anti-VE-cadherin antibody (BV13, eBiosciences). The frequency of BrdU+ cells was then analyzed by flow cytometry using the APC BrdU Flow Kit (BD Biosciences). Freshly dissected bones were fixed in 4% paraformaldehyde overnight followed by 3-day decalcification in 10% EDTA. Bones were sectioned using the CryoJane tape-transfer system (Instrumedics, St. Louis, MO). Sections were blocked in PBS with 10% horse serum for 1 hr and then stained overnight with goat-anti-Angpt1 (Santa Cruz, Dallas, TX, 1:200), chicken-anti-GFP (Aves, Tigard, OR, 1:1000), anti-CD41-PE (eBioscience, clone eBioMWReg30, 1:200) and/or goat-anti-Osteopontin (R&D, Minneapolis, MN, 1:400) antibodies. Donkey-anti-goat Alexa Fluor 647, donkey-anti-chicken Alexa Fluor 488, and/or Donkey-anti-goat Alexa Fluor 555 were used as secondary antibodies (Invitrogen, Grand Island, NY, 1:400). Slides were mounted with anti-fade prolong gold (Invitrogen) and images were acquired with a LSM780 confocal microscope (Zeiss, San Diego, CA). For thick sections, the specimens were cleared overnight with Benzyl Alcohol/Benzyl Benzoate (1:2) solution (Sigma). 3D reconstruction of bone marrow was achieved by Z stack of tiled images of femoral bone marrow with a Zeiss LSM780 confocal microscope. We defined regressed sinusoids according to the criteria used in a previous publication (Hooper et al., 2009). We analyzed sinusoid morphology in thin optical sections through a segment of the femurs of mice. The sections were transverse sections through the longitudinal axis of the femurs, such that we observed cross-sections through most sinusoids. We first counted the total number of sinusoids in the section. Sinusoids were identified in these sections based on vessel morphology and bright VE-cadherin staining (VE-cadherin staining was dimmer in arterioles and capillaries). We then counted the number of regressed sinusoids in the same sections to arrive at the percentage of regressed sinusoids. Regressed sinusoids (Figure 7D) were distinguished from non-regressed sinusoids (Figure 7C) by being larger in diameter and having few hematopoietic cells around them. This assay was modified from a published method (Radu and Chernoff, 2013). Mice were retro-orbitally injected with 200 μl of 0.5% Evans blue in PBS and sacrificed 15 min later. Femurs and spleens were collected, crushed, and then Evans blue in these tissues was eluted in a set volume of PBS. After a brief centrifugation, the concentration of Evans blue in the supernatant was measured on a Nanodrop spectrophotometer (Thermo Scientific, Waltham, MA) at a wavelength of 610 nm. Femurs and spleens from mice without Evans blue injection were used as negative controls and blanks. Mice were anaesthetized by i.p. injection of ketamine/xylazine. Before imaging, the mice received a retro-orbital injection of 100 μl PBS solution containing 10 μg Alexa Fluor 660 conjugated anti-VE-cadherin antibody (BV13, eBiosciences) and 100 μg Dextran-FITC (70-kDa, Sigma). Then, the mouse was placed on a heated stage with the skull positioned under the objective using a stereotaxic device. Dextran-FITC fluorescence and autofluorescence from bone collagen were captured using two-photon imaging while Alexa Fluor 660-anti-VE-cadherin fluorescence was captured using confocal imaging on the same LSM780 microscope (Zeiss). An approximately 4 × 6 mm area of the calvarium encompassing most of the parasagittal bone marrow cavities within the left and right frontal bones was scanned in each imaging section. Euthanized mice were pre-fixed by vascular perfusion via the left ventricle for 10 min with a solution containing 2% glutaraldehyde, 2% paraformaldehyde, and 0.1 M cacodylate buffer at pH 7.3. A 1 ml syringe fitted with a 23-gauge needle (BD Biosciences) containing ice-cold PBS was inserted into the growth plate and the then entire marrow plug was gently flushed from the marrow cavity. The marrow plugs were post-fixed in 2.5% glutaraldehyde overnight. They were partially dehydrated in ethanol, fractured in liquid nitrogen, rehydrated, and then fixed in 1% osmium tetroxide for another 2 hr. After full dehydration using a graded series of ethanol concentrations followed by hexamethyldisilazane, the specimens were coated with sliver. Two to three specimens per mouse were randomly chosen and examined on a Zeiss Sigma VP FE-SEM at 5–10 mkV at the UT Southwestern Electron Microscopy Core Facility. Cavstratin, a fusion peptide of the putative scaffolding domain of caveolin-1 (amino acids 82–101: DGIWKASFTTFTVTKYWFYR) and the antennapedia internalization sequence (RQIKIWFQNRRMKWKK), was synthesized as previously described (Gratton et al., 2003) at the UT Southwestern Protein Chemistry Technology Center. Peptides were dissolved initially in DMSO and diluted 1000-fold in sterile PBS before in vivo administration (2.5 mg/kg per mouse). The Journal of Clinical Investigation 124:824–834. Journal of Magnetic Resonance Imaging 9:643–652. The Journal of Experimental Medicine 202:739–750. Biochemical and Biophysical Research Communications 195:301–309. The Journal of Clinical Investigation 121:2278–2289. The Journal of Experimental Medicine 193:741–754. Investigative Ophthalmology & Visual Science 55:2191–2199. The International Journal of Developmental Biology 48:645–653. The Journal of Experimental Medicine 206:2483–2496. Proceedings of the National Academy of Sciences of USA 100:12753–12758. Journal of Visualized Experiments 16:e50062. The Journal of Clinical Investigation 124:4320–4324. Proceedings of the National Academy of Sciences of USA 99:8219–8224. Thank you for sending your work entitled “Hematopoietic stem and progenitor cells regulate the regeneration of their niche by secreting Angiopoietin-1” for consideration at eLife. Your article has been favorably evaluated by Janet Rossant (Senior editor), a Reviewing editor, and 4 reviewers. As you can see, all of your reviewers felt the work has merit and is in principle suited for eLife. In particular, the reviewers commented favorably on the rigorous quality of the study and the clarity of the writing. However, each of the reviewers raised some concerns, which you will want to address in revising the work. Here, I point to reviewer #1's major points, as resolving them does seem to be important to make the conclusions that you do. In fact, as pointed out by both reviewers 1 and 2, most effects do seem to be mediated by LepR+ stromal cells, rather than HSCs/progenitors. To unequivocally resolve this point, it seems reasonable to address whether the Ang1 knockout affects stromal cells in the bone marrow directly or indirectly, and in particular whether any of the cellular changes in the Mx1-Cre Ang1fl/fl bone marrow, when transplanted into LepR+ stromal Ang1 knockout recipients can promote HSC and vasculature regeneration that is HSC/HSC progeny independent. As pointed out by reviewers 1 and 3, it is important to determine whether Ang1, Ang2 or Tie2 expression change upon irradiation and upon transplantation during recovery. As the reviewers suggest, a transplantation experiment with just HSCs and their downstream lineages is needed to assess whether these proteins from HSCs/progenitors have an effect on their niche or whether the effects come solely from LepR+ stromal cells. Reviewer 3 also notes the sometimes opposing roles of Ang1 and Ang2, making this all the more important to investigate and resolve. Reviewer 3 also raises some valid points regarding regression of vessels. Again, along the lines of reviewer 1 with regards to concern, the reviewer questions whether the loss of Ang-1 itself has a direct effect on BM recovery or whether the effect on BM recovery is secondary to vascular leakiness. The reviewer suggests that introducing exogenous Ang-1 into WT irradiated recipient, or injecting an unrelated anti-permeability agent in Mx-1→ Lepr irradiated recipients would help resolve this issue. The experiment seems straightforward and useful to solidify the claims made. Finally, reviewer 4 raises two important issues regarding the claim that the Ang1/Tie2 axis has a role in regeneration of vasculature after irradiation. In particular, he/she raises 3 simple but important points, which merit addressing in your revised manuscript. The first issue, that of % of cells expressing Ang1 seems straightforward to correct. The issue of whether you've completely knocked out Ang1 in the osteoblasts is critical to resolve. The issue of the vasculature is one that has haunted all of your reviewers in different ways, and here it seems essential to shore up the additional issues raised by reviewer 4 in this regard. If you can satisfactorily address the issues delineated above, eLife would welcome revised text and figures (and possibly a revised title, pending the outcome of the study). The manuscript by Zhou et al. examined the cellular source and functional importance of a secreted molecule Angiopoietin-1 (Ang1) in the HSC niche. Previous studies have identified HSCs and the perivascular stromal cells as potential source(s) for Ang1. Here, Bo et al. took one step forward and systematically knocked out Ang1 from a wide variety of cell types in the bone marrow to examine its function during homeostasis and upon irradiation. They demonstrated that although Ang1 is dispensable for HSC maintenance under steady condition, Ang1 delays HSC regeneration and bone marrow vasculature recovery after irradiation. Overall, this study represents a comprehensive analysis of Ang1's function in the HSC niche. The analysis is rigorous, and the manuscript is well written. How niche recovery is regulated after injury is an important topic which remains poorly understood. This study by Zhou et al. provides an interesting example, and will be of great interest to the broad readership of eLife. However, a few major points, if unresolved, can influence the authors' conclusions and interpretations. A) The expression of Mx1 promoter is fairly complex and dynamics, which includes HSCs, progenitors, and many different stroma cells in the bone marrow. In a bone marrow transplant, in addition to HSCs and progenitors, a wide variety of other cell types in the bone marrow are also transplanted together into the recipients. While many of these cells do not sustain in the recipient for long-term, short-term effects from these transplanted mesenchymal cells cannot be excluded. Does Ang1 knockout affect additional stroma cells in the bone marrow directly or indirectly? Can any of these cellular changes in the Mx1-Cre Ang1fl/fl bone marrow, when transplanted into recipients that has Ang1 knockout in the LepR+ stroma, promote HSC and vasculature regeneration that is HSC/HSC progeny independent? These possibilities cannot be formally ruled out with the experimental data presented. These issues will be difficult to resolve with merely negative data. Hence, the authors should do a transplantation experiment with just HSCs and their downstream lineages (e.g., isolate hematopoietic lineages from the Mx1-Cre; Ang1fl/fl mice and transplant into recipient mice). This will be an unambiguous support that Ang1 from Hematopoietic stem and progenitor cells truly has an effect on their niche. Otherwise it will be the HSC niche itself, and specifically the LepR+ cells, mediate niche recovery, with minor help from HSCs at the very best. This will still be an interesting discovery, but the authors will need to revise their Title and manuscript accordingly. Angiopoietin-1/Tie2 signaling has been shown to regulate adult hematopoiesis and hematopoietic recovery. Contradictory reports have been published on the source of Ang-1 in the hematopoietic stem cell niche and the role of osteoblasts in the niche. In this manuscript, the authors systematically evaluate Ang-1 expression in various BM HSC niche compartments by using state-of-art lineage analysis and excellent quality imaging. The role of Ang-1 in steady state hematopoiesis and HSC regeneration is studied by using various genetic models. It is quite clear from the BM transplantation experiments that Ang-1 can decrease hematopoietic recovery and deletion of Ang-1 improves the BM sinusoidal recovery. Ang-1 from LepR-expressing stromal cells seems to be a key player in regulating the niche regeneration. This is an interesting study that settles a paradox in the field. The data are very convincing and thorough. Publication is recommended with high priority. 1) Col2.3-Cre;Ang-1fl/fl mice had normal WBC counts and normal HSC frequencies. However, in the transplanted mice, the T cell levels seemed to be affected during recovery. Could the authors comment on CLP levels in these mice and about their thymus? 2) The authors show that Ang-1 from endothelial or hematopoietic cells is not required for hematopoiesis by generating Tie2-cre;Ang-1fl/fl mice. Does it affect the angioblast differentiation? How does the endothelium look like? It would be good to check the deletion efficiency in these mice. 3) After irradiation, hematopoietic regeneration was accelerated in LepR+cell specific Ang-1 deleted mice at day 8 and day 12, although the CD150+CD48- HSCs frequency was not affected in Mx-1cre; ang1 mice. Could the authors comment on ST-HSCs? 4) Technical question: Methycellulose medum *M3434 may not be optimized for detecting CFU-Mk and it could be difficult to distinguish based on morphology. Did the authors stain the CFU-Mk or simply based on morphology? 1) What is the expression pattern change of Ang-1, Ang-2 and Tie2 in the BM after irradiation and during recovery? Even though Figure 2I indicates that hematopoietic cells and LepR+ cells are the major contributor for secreted Ang-1 during homeostasis, the absence of these population during injury can affect the dynamic of Ang/Tie2 signaling. Furthermore, Ang-1 and Ang-2 often have opposing effects on the vasculature so it would be important to see what role Ang-2 plays during recovery. 2) Can the authors more clearly define the parameters in which they measured the regressed vasculature in Figure 5F as this was not described in the Methods section? This is important because the vasculature is usually defined not just by the number of cells (such as % VE-Cadherin+ cells by FACS as in Figure 5–figure supplement 1) but by the vessel diameter, size, branch points etc. How do you define the regression of vessels? 3) Perhaps the most interesting but the most intriguing part of the paper is the discrepancy between the timeline of vessel regression (in Figure 5F which inversely correlated with the LSK recovery in Figure 4B) and vascular permeability in Figure 6A. It seems that vascular permeability was the most different on day 28 in Mx-1→ Lepr, AFTER vessel regression has caught up and normalized with concomitant LSK recovery. It is thus not clear to this reviewer whether the loss of Ang-1 itself has a direct effect on BM recovery or whether the effect on BM recovery is secondary to vascular leakiness. The authors stated in their Discussion that: “Together, the data indicate that Ang-1 produced by LepR+ stromal cells and hematopoietic cells promotes vascular integrity in regenerating blood vessels in the bone marrow at the cost of slowing the regeneration of HSC niches and hematopoiesis.” Please clarify and elaborate whether there might be a causal relationship between vascular leakiness and BM recovery? And if so, how can vascular leakiness promote BM recovery? The authors can also more definitively address this issue by introducing exogenous Ang-1 into WT irradiated recipient, or injecting an unrelated anti-permeability agent (such as those used in Gratton J et al., (2003) Cancer Cell 4:31) in Mx-1→ Lepr irradiated recipients to see if BM recovery can be delayed. The manuscript by Zhou et al. look at hematopoiesis and bone marrow vascular affect in mice deleted for Ang1 in various populations of bone marrow cells. They conclude that the Ang1/Tie2 axis has a role in regeneration of vasculature after irradiation. There are 2 major issues regarding the observations. The effects observed by the authors are modest at best, and it is not entirely clear whether other cell populations other than those examined by the authors are contributing to vascular regeneration. Specific comments follow. 1) Statement that 72% of Kit+ cells but only Kit- cells are Ang1+ is misleading since there are many more Kit- cells than Kit+ cells. 2) As shown by the Lpr-cre experiments, homozygous deletion of two floxed alleles is difficult. How efficient was the deletion by Col2.3-cre, Osx-cre and Ubx-crER? Are there residual osteoblasts that have a normal allele? 3) The affects on vasculature are rather modest. Is this because Ang1 expression by cells other than the ones targeted by the various Cre vectors, incomplete deletion, or simply a modest role fo Ang1/Tie2 in blood vessel regeneration? The reviewer is correct that Angpt1 synthesized by LepR+ stromal cells appears to have a greater effect on the phenotypes we studied as compared to Angpt1 synthesized by hematopoietic cells. This is likely because in the early days (day 8 and 12) after irradiation and bone marrow transplantation, hematopoietic stem and progenitor cells are more rare than LepR+ stromal cells. However, Leprcre; Angpt1GFP/fl mice transplanted with Angpt1 deficient bone marrow cells always had significantly faster vascular and bone marrow regeneration than Leprcre; Ang1GFP/fl mice transplanted with control bone marrow cells (Figure 6A, 6B, 6D and 7J) as well as significantly greater vessel leakiness in the bone marrow (Figure 8A and 8D). Therefore, the data are consistent with our conclusions. Mx1-Cre does recombine in a variety of stromal cells other than hematopoietic cells in the bone marrow, including endothelial cells, perivascular stromal cells and osteoblasts. Conditional deletion of Angpt1 by Mx1-Cre, or Lepr-Cre, or both, had no significant effects in normal mice on the numbers of VE-Cadherin+ endothelial cells or LepR+ perivascular cells (Figure 7A and 7B), vascular integrity (Figure 8A), hematopoiesis (Figure 3F-3O, 6B and 6C), or the morphology of the vasculature in the bone marrow (Figure 7–figure supplement 1A). We are therefore unable to find any evidence that conditional Angpt1 deletion in normal mice affects the frequency or quality of stromal cells in the bone marrow. In the transplantation experiments performed using Mx1-cre; Angpt1fl/fl bone marrow cells in the original manuscript it is unlikely that they contained significant numbers of stromal cells because the bone marrow cells were obtained without enzymatic dissociation. Enzymatic dissociation is required to obtain significant numbers of stromal cells from the bone marrow (Cell Stem Cell 15:154). Without enzymatic dissociation, the frequency of VE-Cadherin+ endothelial cells or LepR+ perivascular cells was less than one cell per million whole bone marrow cells (data not shown). Consistent with this, no CFU-F colonies could be detected when one million non-enzymatically dissociated bone marrow cells were cultured for 2 weeks (data not shown). We have not detected any changes in Angpt1 expression after irradiation and transplantation. We have added new data to the manuscript in which we analyzed Angpt1-GFP expression in the bone marrow at days 8, 12, 16, and 28 after irradiation and bone marrow transplantation. Among hematopoietic cells, Angpt1-GFP expression was still highly restricted to c-kit+ hematopoietic progenitors and megakaryocytes at all time points analyzed after irradiation (Figure 6–figure supplement 2A). It should be noted that at 8 days after irradiation no Angpt1-GFP+ hematopoietic cells were detected, consistent with the depletion of c-kit+ hematopoietic progenitors and megakaryocytes during the early phase of recovery from irradiation (Figure 6-figure supplement 2A). Among stromal cells, Angpt1-GFP expression was still highly restricted to LepR+ perivascular stromal cells (Figure 6–figure supplement 2B and 2C). Even after irradiation we did not detect Angpt1-GFP expression by endothelial cells or osteoblasts (Figure 6–figure supplement 2D and 2H). Therefore, we did not observe any changes in Angpt1 expression after irradiation and transplantation. We have performed two new experiments to address this issue directly. First, we transplanted 4000 LSK (Lineage-Sca-1+c-kit+) cells from control and Mx1-cre; Angpt1fl/fl mice into Leprcre; Angpt1GFP/fl mice to test the effects of hematopoietic progenitors uncontaminated by stromal cells on vascular and hematopoietic regeneration after irradiation. We found that the mice transplanted with Angpt1 deficient LSK cells had significantly higher bone marrow cellularity (Figure 6E), LSK cell numbers (Figure 6F), and better vascular morphology in the bone marrow (Figure 7L and 7M) than mice transplanted with control LSK cells at 14 days after irradiation. The mice transplanted with Angpt1 deficient, but not control, LSK cells also exhibited vascular leakage in bone marrow at 28 days after irradiation (Figure 8B and 8E). These data demonstrate that Angpt1 expression by hematopoietic cells regulates hematopoietic and vascular recovery after irradiation. The only hematopoietic cells other than c-kit+ hematopoietic stem and progenitor cells that express Angpt1 are megakaryocytes (Figure 1D-1F and 1J-1L). To test whether Angpt1 expression by megakaryocytes contributes to the regulation of hematopoietic and vascular recovery we conditionally deleted Angpt1 from megakaryocyte lineage cells using Pf4-Cre and transplanted whole bone marrow cells from control and Pf4-cre; Angpt1fl/fl mice into Leprcre; Angpt1GFP/fl recipients. We did not detect any significant differences in hematopoietic or vascular recovery between mice transplanted with control versus Pf4-cre; Ang1fl/fl bone marrow (Figure 6G, 6H, 7N, 7O, 8C and 8F). 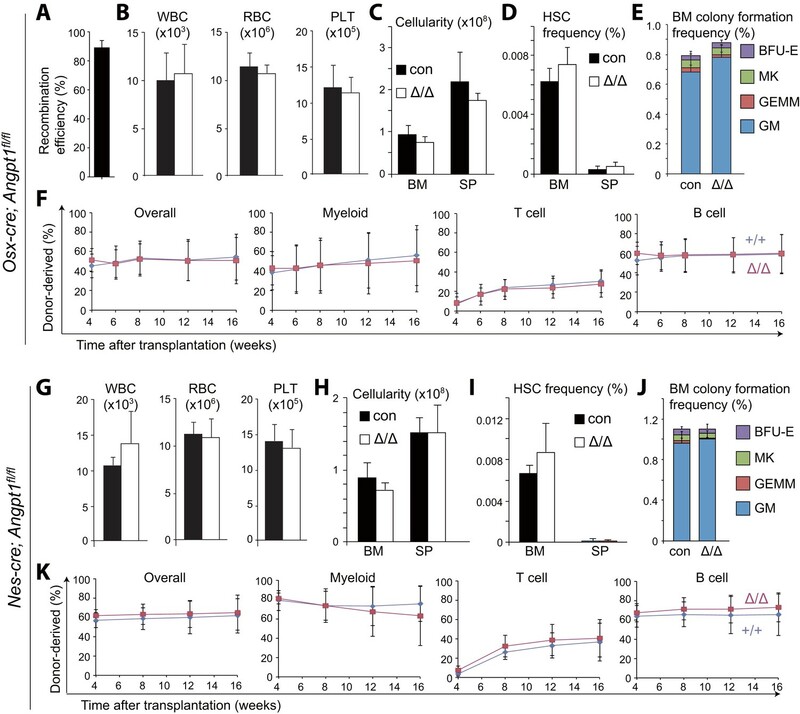 These data suggest that Angpt1 expression by megakaryocyte lineage cells has little effect on hematopoietic and vascular recovery after irradiation. Together, our data demonstrate that Angpt1 expression by hematopoietic stem and progenitor cells regulates hematopoietic and vascular recovery after irradiation, along with Angpt1 expressed by LepR+ stromal cells. We did not detect significant differences between control and Col2.3-cre; Angpt1fl/fl mice with respect to CLP numbers in the bone marrow, thymus cellularity, or frequencies of CD4+ and/or CD8+ T cells in the thymus (Figure 3–figure supplement 2C-2E). The reduced T cell reconstitution from Col2.3-cre; Angpt1fl/fl bone marrow was modest and transient as the difference was not statistically significant at 16 weeks after transplantation (Figure 3E). This is consistent with our observation that osteoblasts do not express Angpt1. We looked at the bone marrow endothelium by whole-mount VE-Cadherin staining in control and Tie2-cre; Angpt1fl/fl mice at two months of age and did not detect any differences in the morphology or density of the vasculature in the bone marrow (see new Figure 5F). This is consistent with a prior study that found ubiquitous deletion of Angpt1 after E13.5 did not affect vascular morphology or function in normal uninjured mice (J. Clin. Invest. 121:2278). We tested the deletion efficiency of Angpt1fl in VE-Cadherin+CD45-Ter119- endothelial cells and CD45+Ter119+ hematopoietic cells obtained from Tie2-cre; Angpt1fl/fl mice. The deletion efficiencies in both cell populations were approximately 97% (see new Figure 5A). We do not know how to identify angioblasts or to test their function so would need more direction from the reviewer if the foregoing data are not sufficient. The frequency of CD150-CD48-LSK ST-HSCs (Figure 3–figure supplement 2J) or LSK cells (Figure 6B) was also not significantly different between Mx1-cre; Angpt1fl/fl and control bone marrow in normal mice. We supplemented methylcellulose medium M3434 with TPO (10 ng/ml) and FLT3 (10 ng/ml) to optimize the detection of CFU-Mk. This allowed us to detect Mk colonies formed by single HSCs really well. The CFU-Mk colonies were identified based on morphology, based on the presence of morphologically distinct, large megakaryocytes. As requested, we added new data showing the expression of Angpt1, Angpt2 and Tie2 in the bone marrow after irradiation and bone marrow transplantation. The short answer is that we have not detected any significantly changes in the expression patterns of any of these genes in the bone marrow after irradiation and transplantation. We have not detected any changes in Angpt1 expression after irradiation and transplantation. We analyzed Angpt1-GFP expression in the bone marrow at days 8, 12, 16, and 28 after irradiation and bone marrow transplantation. Among hematopoietic cells, Angpt1-GFP expression was still highly restricted to c-kit+ hematopoietic progenitors and megakaryocytes at all time points analyzed after irradiation (Figure 6–figure supplement 2A). It should be noted that at 8 days after irradiation no Angpt1-GFP+ hematopoietic cells were detected, consistent with the depletion of c-kit+ hematopoietic progenitors and megakaryocytes at early phases of recovery from irradiation (Figure 6–figure supplement 2A). Among stromal cells, Angpt1-GFP expression was still highly restricted to LepR+ perivascular stromal cells (Figure 6–figure supplement 2B and 2C). Even after irradiation we did not detect Angpt1-GFP expression by endothelial cells or osteoblasts (Figure 6–figure supplement 2D and 2H). Consistent with prior studies (Cancer Letters 328:18) we found that Angpt2 was expressed mainly by endothelial cells in the bone marrow under normal conditions as well as after irradiation (Figure 6–figure supplement 2I). Depending on the context, Angpt1 and Angpt2 may have either opposing or synergistic effects on the vasculature (Nat Rev Mol Cell Biol 10:165; J. Clin. Invest. 124:4320). While it would be interesting to assess the function of Angpt2 during recovery after irradiation we believe these studies are outside the scope of this manuscript as they would require us to obtain Angpt2flox mice (which we do not have) and to redo all of our experiments in new genetic backgrounds. No matter how those experiments turn out, they would not affect any of the conclusions of the current manuscript. In both normal adult bone marrow and at days 12-28 after irradiation and transplantation, Tie2 was expressed by most LSK hematopoietic stem/progenitors cells, most c-kit+ hematopoietic progenitors, and most endothelial cells (see new Figure 6–figure supplement 2E-2G). At day 8 after irradiation Tie2 was still expressed by most endothelial cells but there LSK cells and c-kit+ cells were extremely rare in the bone marrow. Tie2 was rarely expressed by LepR+ stromal cells or c-kit negative hematopoietic cells either in normal bone marrow or after irradiation (see new Figure 6–figure supplement 2E-2G). We defined regressed sinusoids according to the criteria used in a previous publication from Shahin Rafii’s lab (Cell Stem Cell 4:263). Regressed sinusoids are dilated and have fewer surrounding hematopoietic cells as compared to normal sinusoids. We analyzed sinusoid morphology in thin optical sections through a segment of the femurs of mice. The sections were transverse sections through the longitudinal axis of the femurs, such that we would observe cross-sections through most sinusoids. In these thin optical sections, we first counted the total number of sinusoids in the section. Sinusoids were identified in these sections based on vessel morphology and bright VE-cadherin staining (VE-cadherin staining was dimmer in arterioles and capillaries). We then counted the number of regressed sinusoids in the same sections to arrive at the percentage of regressed sinusoids, as shown in Figure 7J. Regressed sinusoids were distinguished from non-regressed sinusoids by being larger in diameter and having few hematopoietic cells around them. This is illustrated in a new Figure 7C (showing normal sinusoids) versus 7D (showing regressed sinusoids) that we have added to the manuscript. In our experience there is regional recovery of the bone marrow, where some regions recover normal sinusoid morphology and hematopoiesis before others. Statistics are based upon analyses of three sections per mouse and at least three mice per time and treatment. We have added a discussion of these issues to the Methods. To test whether there is a causal relationship between vascular leakiness and hematopoietic recovery we injected Cavtratin, the unrelated anti-permeability agent suggested by the reviewer (Cancer Cell 4:31), in control and Mx1→Lepr recipients from 7 to 13 days after irradiation then analyzed the mice. Based on both Dextran-FITC live-imaging and Evans blue extravasation, Cavtratin administration significantly reduced vascular leakiness in both control and Mx1→Lepr recipient mice (Figure 9A and 9B). However, Cavtratin administration did not significantly affect the recovery of bone marrow cellularity or LSK cell numbers in the bone marrow of control or Mx1→Lepr recipients (Figure 9C and 9D). 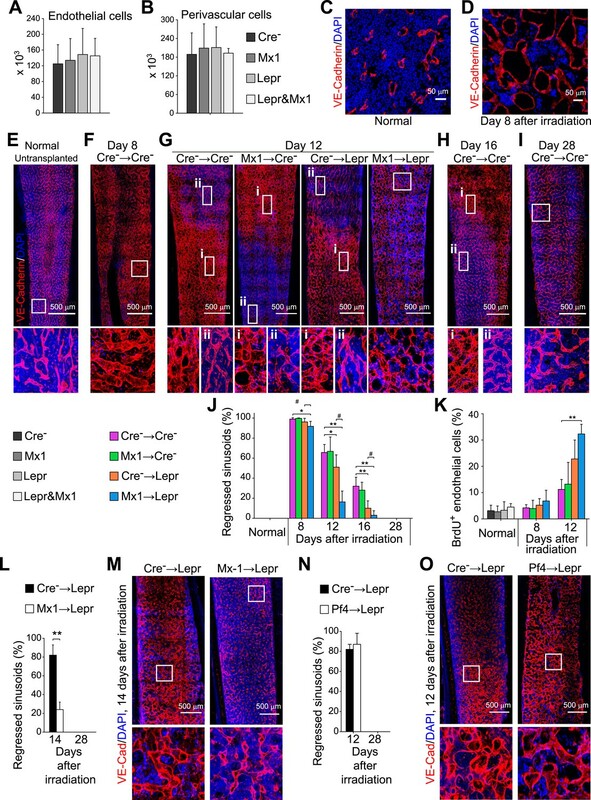 Mx1→Lepr recipients continued to regenerate marrow cellularity and LSK cell numbers significantly faster than control mice, irrespective of Cavtratin treatment. These data demonstrate that the accelerated recovery of hematopoietic stem/progenitor cells and hematopoiesis in the absence of Angpt1 is not caused by the increase in vascular leakiness. These appear to reflect independent effects of Angpt1. To clearly show the relationship between c-kit and Angpt1 expression we have included a new figure in the revised manuscript showing c-kit versus Angpt1-GFP expression among mechanically dissociated bone marrow cells (Figure 1–figure supplement 1E). The data show that about 85% of Angpt1-GFP+ hematopoietic cells are c-kit+. It is important to note that we have not been able to detect any Angpt1 expression by osteoblasts (see Figure 2D, 2E and 2I), consistent with the lack of any functional phenotype upon conditionally deleting in these cells. Nonetheless, as requested we have added new data to the manuscript measuring the deletion efficiency of Angpt1fl by Col2.3-Cre, Osx-Cre and UBC-Cre/ER. The recombination efficiency of Angpt1fl was measured by real-time PCR analysis of genomic DNA from flow cytometrically purified cells. The amplification of the Angpt1fl allele in mutant mice was compared to the amplification of the same product from Angpt1fl/fl control mice. An unrelated genomic locus was amplified in parallel to normalize DNA content among samples. Col2.3-Cre deleted 94±3.0% of Angpt1fl alleles in Col2.3-GFP+ osteoblasts from Col2.3-cre; Angpt1fl/fl; Col2.3-GFP mice (see new Figure 3–figure supplement 2A). Osx-Cre deleted 93±3.0% of Angpt1fl alleles in CD45-Ter119-CD31-PDGFRα+CD105+ osteoprogenitors from Osx-cre; Angpt1fl/fl mice (see new Figure 4A). UBC-Cre/ER deleted 95±2.2% of Angpt1fl alleles in LSK cells from Ubc-creER; Angpt1fl/fl mice administered tamoxifen-containing chow for at least a month (see new Figure 3–figure supplement 2K). 3) The effects on vasculature are rather modest. Is this because Ang1 expression by cells other than the ones targeted by the various Cre vectors, incomplete deletion, or simply a modest role fo Ang1/Tie2 in blood vessel regeneration? There are a number of possibilities. First, there could be some compensation by other Angiopoietin family members. Second, our approach of conditionally deleting Angpt1 from specific cell types has the advantage of identifying the physiologically important sources of Angpt1 in the bone marrow but the disadvantage that secondary sources could partially rescue the phenotype when we delete from the main sources (hematopoietic stem/progenitor cells and LepR+ stromal cells). Finally, it is possible that the function of Angpt1 is modest. No matter which of the above turn out to be true, our manuscript will have made two important points. First, that the function of Angpt1 in the hematopoietic system is quite different from what was originally claimed in a highly cited paper (it is not an osteoblast specific promoter of HSC maintenance and quiescence). Second, our data make the conceptually important point that hematopoietic stem/progenitor cells regulate niche regeneration after injury. We believe this is the first clear evidence that normal HSCs regulate their niche. All prior studies have focused on mechanisms by which the niche regulates HSCs. SJM is a Howard Hughes Medical Institute (HHMI) Investigator, the Mary McDermott Cook Chair in Pediatric Genetics, the director of the Hamon Laboratory for Stem Cells and Cancer, and a Cancer Prevention and Research Institute of Texas Scholar. This work was supported by the NIH NHLBI (HL097760). BOZ was supported by a fellowship from the Leukemia and Lymphoma Society. LD was supported by a Helen Hay Whitney Foundation Fellowship and by HHMI. We thank T Sanders and E Hughes at the UM transgenic core for helping to generate Angpt1GFP and Angpt1fl mice. We thank the UT Southwestern Protein Chemistry Technology Center for helping to synthesize the Cavtratin peptide. This work was initiated in the Life Sciences Institute at the University of Michigan then completed at Children's Research Institute at UT Southwestern. Animal experimentation: This study was performed in strict accordance with the recommendations in the Guide for the Care and Use of Laboratory Animals of the National Institutes of Health. All mice were housed at the Unit for Laboratory Animal Medicine at the University of Michigan or in the Animal Resource Center at the University of Texas Southwestern Medical Center. All protocols were approved by the University of Michigan Committee on the Use and Care Animals and by the University of Texas Southwestern Institutional Animal Care and Use Committee (protocol 2011-0104). © 2015, Zhou et al.